This year, during Childhood Cancer Awareness Month, we highlighted Golden Moments that families have had on their childhood cancer journey. 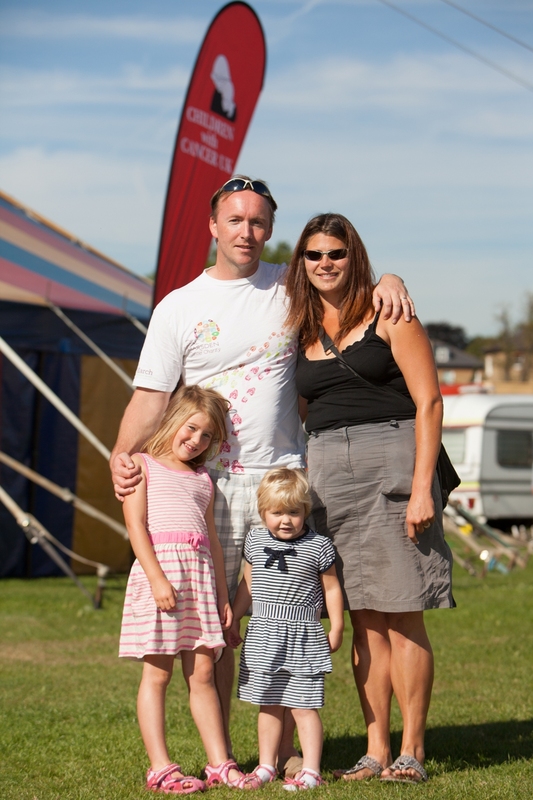 Our aim is to highlight positive memories and stories from children and their families. 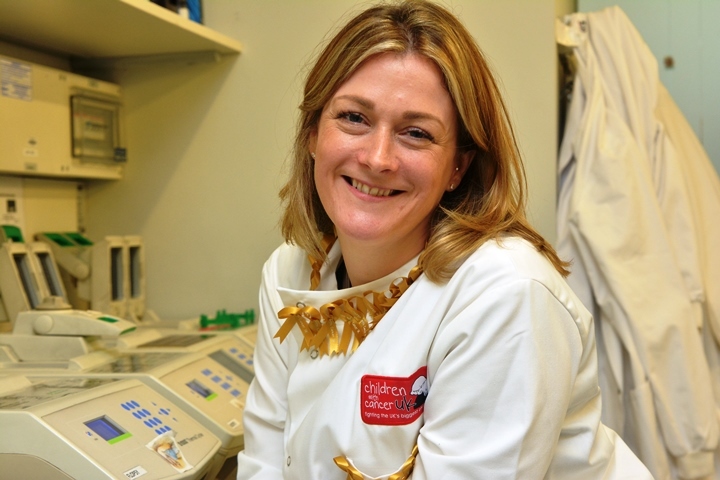 With the donations we receive from our supporters, we can fund more vital research and care that helps give those affected by childhood cancer more opportunities for Golden Moments. However, we must remember that each of these happy memories is but a moment in the long and difficult journey that each family has had to endure. We would love to fill this board with lots more stories, so please do contact us with the Golden Moment from your family’s childhood cancer journey. To read each Golden Moment, just click on the photo. 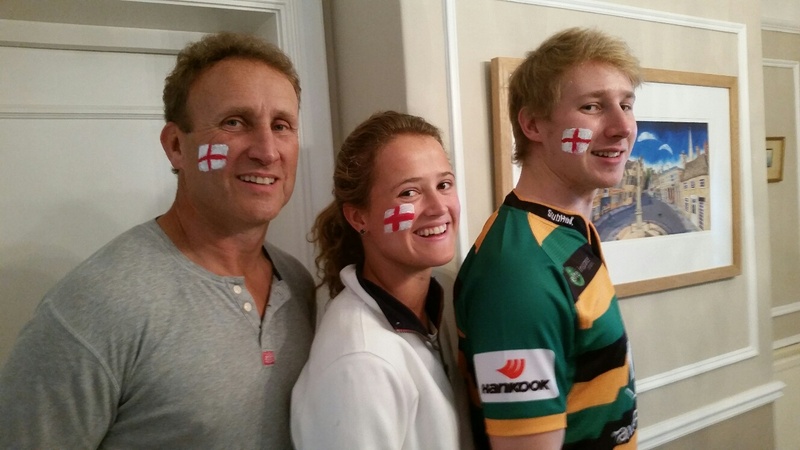 Tom had Ewing’s sarcoma in 2015 and spent a large part of that time as an inpatient in hospital. 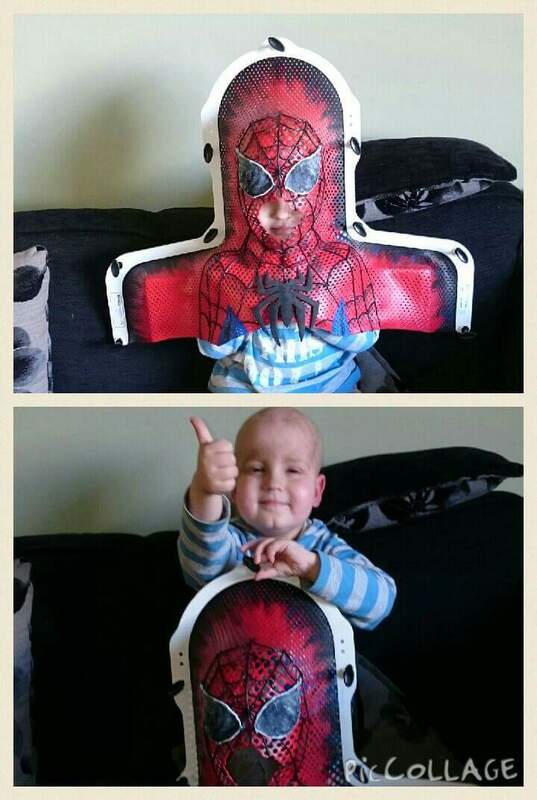 Due to a small complication in the summer his tumour removal surgery was delayed for 2 weeks. This meant we were able to get away to our most favourite place Cornwall. A whole week of no chemo, no blood tests, no transfusions or nurses visits. Was total bliss for everyone. 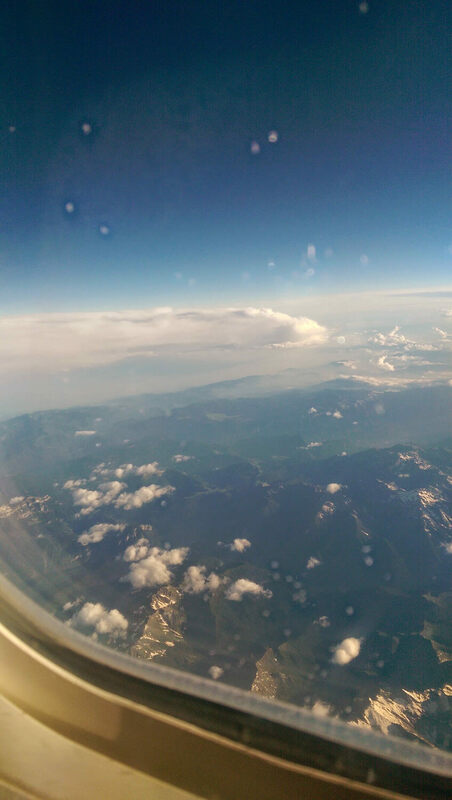 We talk about this trip often and everyone says it was the best holiday we ever had. Unexpected and so appreciated. Just looking through the photos reminds me how lucky we felt that week. The freedom we had we didn’t take for granted. 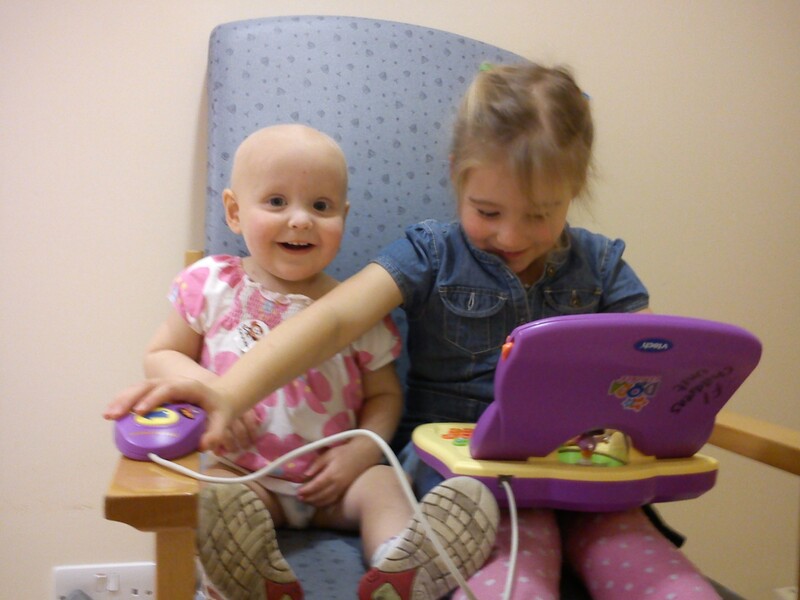 Hopefully by sharing this it shows that life isn’t always all doom and gloom after a childhood cancer diagnosis. We are certainly much more grateful for small moments of peace. Share your own golden moment on our wall! 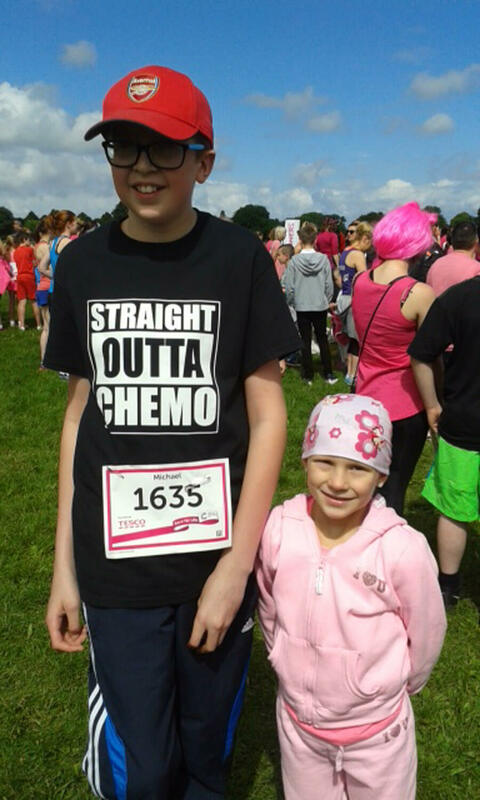 Ethan was diagnosed in January 2013 days before his 15th birthday with a cancer similiar to spindle cell sarcoma. 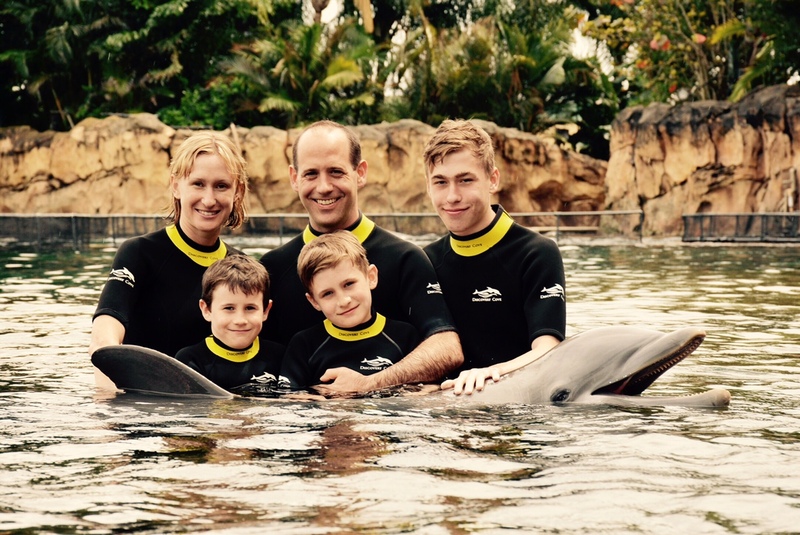 After going through a year of treatment which consisted of chemotherapy, Proton therapy treatment and surgery, Ethan was told that he could have one wish from Make a Wish Foundation he asked for a family holiday. It was quite a tricky task to select a ‘Golden Moment’ as, at the time, every moment was tarnished by the constant worry that comes with cancer; Is this a moment that we will remember happily if she makes it through her treatment or one that will break our hearts, if she doesn’t? There were some amazing experiences during the course of her treatment but every experience was tainted by the shadow of cancer. Personally, I would have foregone every experience if it meant that Molly didn’t have to endure such a horrendous couple of years. Molly, however, got to meet ‘One Direction’ and ‘The Wanted’ and firmly believes that losing her hair and puking constantly was a small price to pay. However the moment that we have chosen is one in which all her school friends came together to help make a really memorable day for us all. 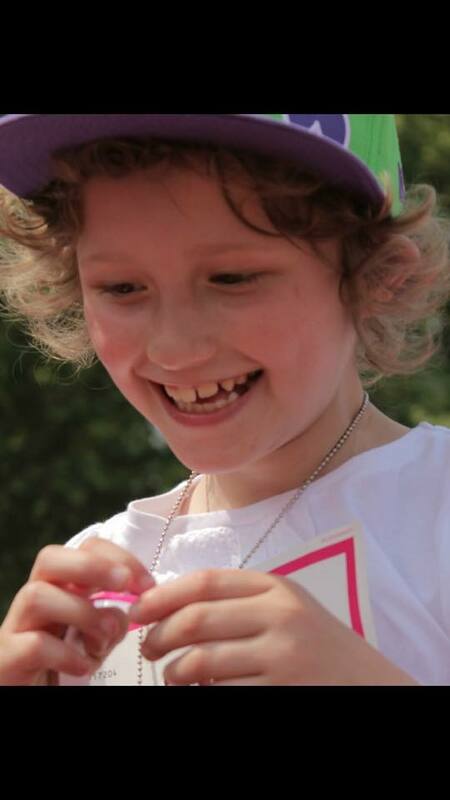 In 2011 when Molly was 8 she was diagnosed with Non-Hodgkin Lymphoma. Just like pretty much every child who undergoes cancer treatment, she didn’t go to school very often, which she was desperate to do. This was ironic given the fact that before her diagnosis she was always utterly delighted to miss a day of school! But the reason she wanted to go was simple – to see her friends and to feel normal. 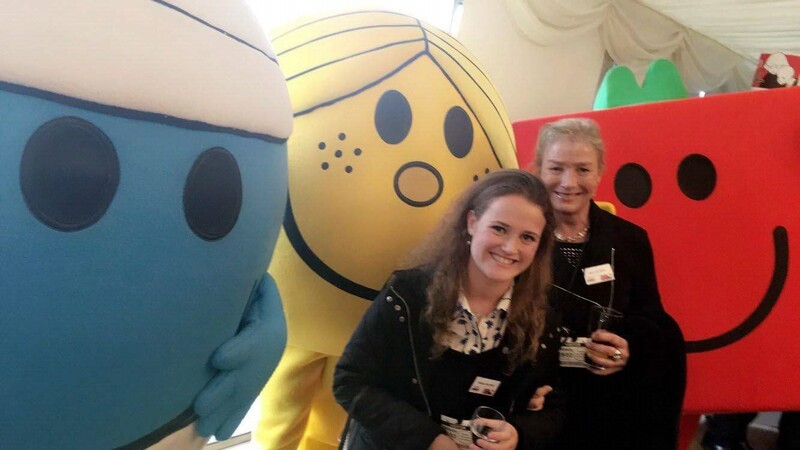 Molly’s friends were always incredibly happy to see her on the days that she felt well enough to attend and they really helped to keep her spirits up. They were always fascinated to hear how things were going, loved her fabulous collection of headscarves, wanted to check out her wig or admire her bald head. They made her feel normal and ‘normal’ is such an important feeling when the rest of your life is in turmoil. 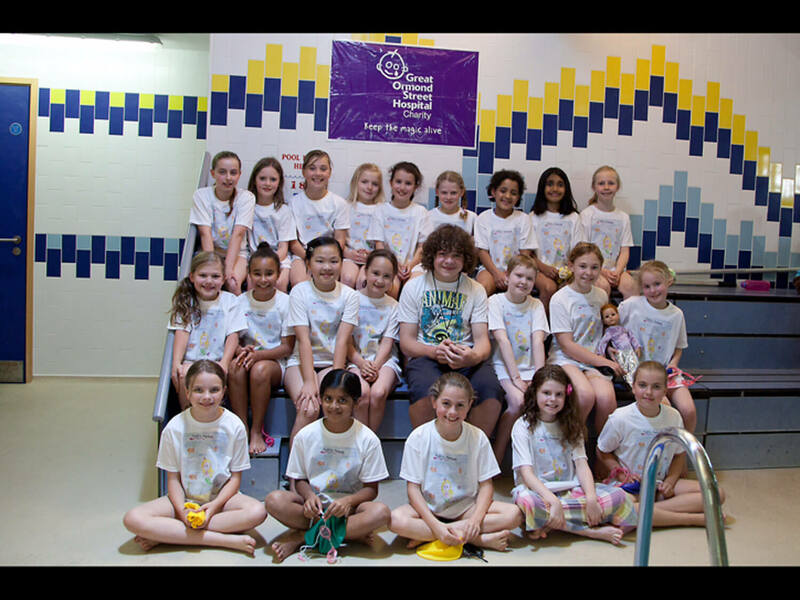 After she had been in treatment for a year, her school friends decided that they wanted to try to raise some money to help other children who were dealing with cancer. So they came up with the idea of a sponsored swim. 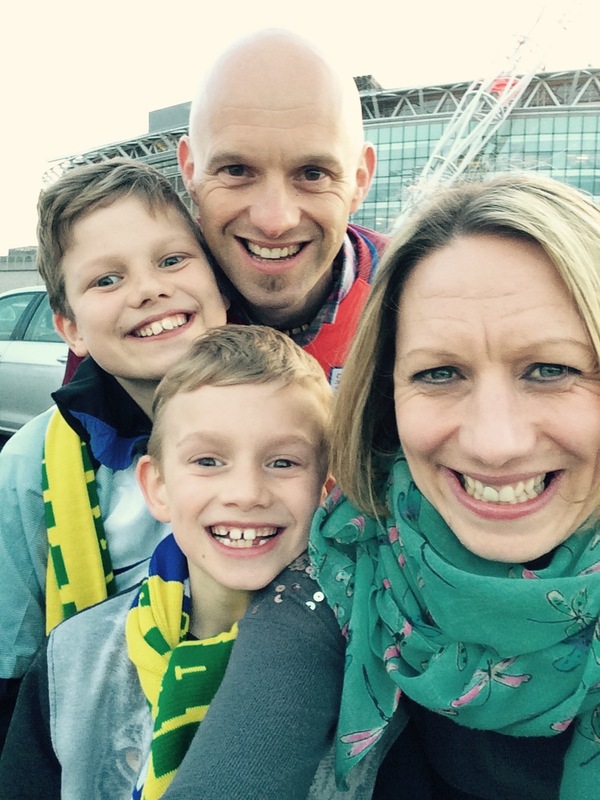 Molly loved swimming and had been in the school swimming team before her chemo began so it made perfect sense. The school kindly gave us the use of their pool and the girls decided that they would attempt to swim as many lengths of it as they could in an hour. Then they came up with a name for themselves, Molly’s Mermaids, and Molly was given the job of drawing a picture to go on the front of the T-shirts. We then begged the very lovely Daniel Roche, who plays Ben in one of Molly’s favourite TV shows ‘Outnumbered’, to come along at short notice to start the swim. So it was all coming together brilliantly when, as is always the case with cancer treatment, a major spanner hit the works. The problem was that Molly had had a Hickman line for the past year (essentially a set of tubes that dangled outside her body so that drugs could be injected into her relatively easily) which prevented her from having a simple bath. Before each soak (in about 4 inches of water) we had to go through the long drawn out process of wrapping her tubes in sandwich bags and then trying to seal them with sellotape and rubber bands so that no water could ever come anywhere near them and so the idea of her jumping into a pool was a total non-starter. 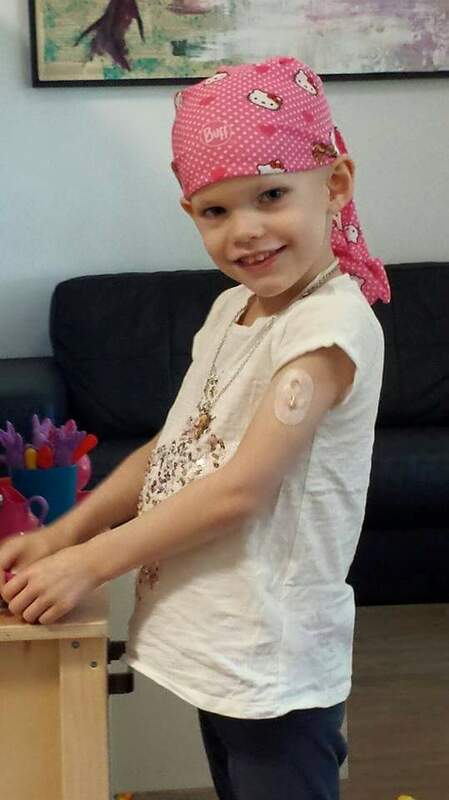 However, she was desperate to join in and had been booked in to have the hickman lines removed and replaced with a portacath (an implant that sits under the skin) which meant she could splash around to her heart’s content. This operation was due to take place about a month before the swim so it all looked good. Then she spiked a temperature. Spiking a temperature was one of the many banes of her life because it meant an immediate trip to hospital and the operation had to be cancelled. 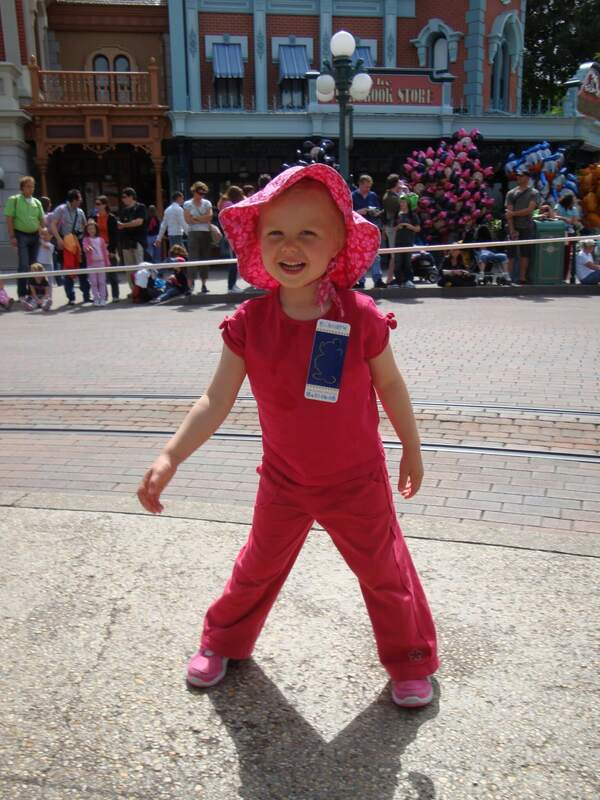 It was a real blow for her and the first time that Molly really railed against cancer. Up until then she had just got on with everything and never questioned why she had been unlucky enough to have been struck down with this nasty, vile disease. As she lay in hospital, with the prospect of the swim going ahead without her, she wept and wept. It looked like yet another missed opportunity. We explained to the doctors and consultants why this operation meant so much to her. She was desperate to jump in that pool. She knew that she wouldn’t actually be able to swim anywhere, as she hadn’t done any exercise for the past year and she hardly had any energy anyway, but she wanted to get in the pool with her friends and just splash about. She had set her sights on starting the race off by leaping in first and then letting everyone else carry on. 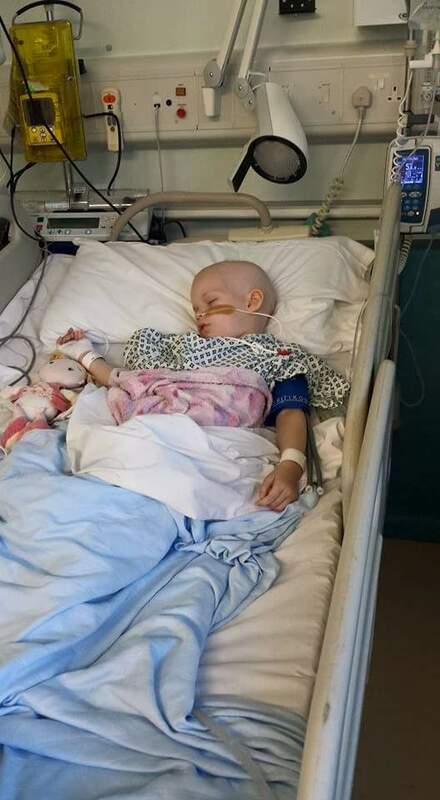 The doctors could see how upset she was and they were as determined as we were that the operation should go ahead to give her the chance to join in. Everyone did all that they could to get her back on track and two weeks before the swim the operation was booked in again. It was the shortest time possible that the doctors would allow to give her enough time to recover from the operation and for the portacath to settle in. The day of the procedure arrived and it all went…swimmingly. Now she just had to stay well for the next two weeks. 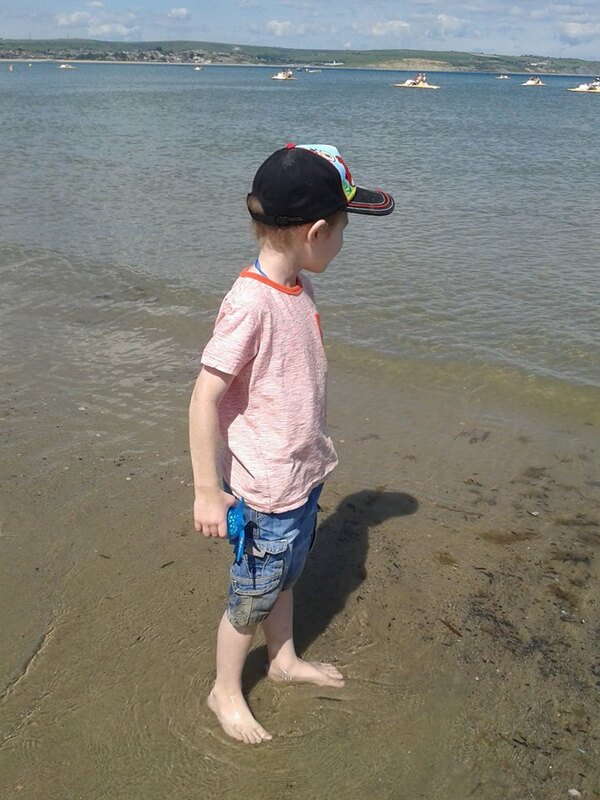 A fortnight later her friends, their parents and Daniel Roche (swoon) all turned up at the school pool on a glorious summer’s day almost exactly a year after her diagnosis. After a few speeches were made and a few tears shed, Daniel counted the girls down to the start of the swim. Molly was given a float, in case she sank, and when Daniel shouted ‘Go’ she leapt in the water and…swam and swam. Her 12 year old brother, Joe, had jumped in alongside her to encourage her and to drag her out if she needed rescuing. But Molly put her head down, held on to the float for all she was worth and tried to paddle a length. We all went wild, shouting and cheering her on and more tears were shed as we watched in amazement as she attempted to swim an entire length without sinking. She did it… and then she turned around and swam another and in the end completed four incredible, inspiring, beautiful lengths before collapsing from sheer exhaustion. Her friends were utterly inspired by her efforts and they all dived in to swim as far as they could in an hour. 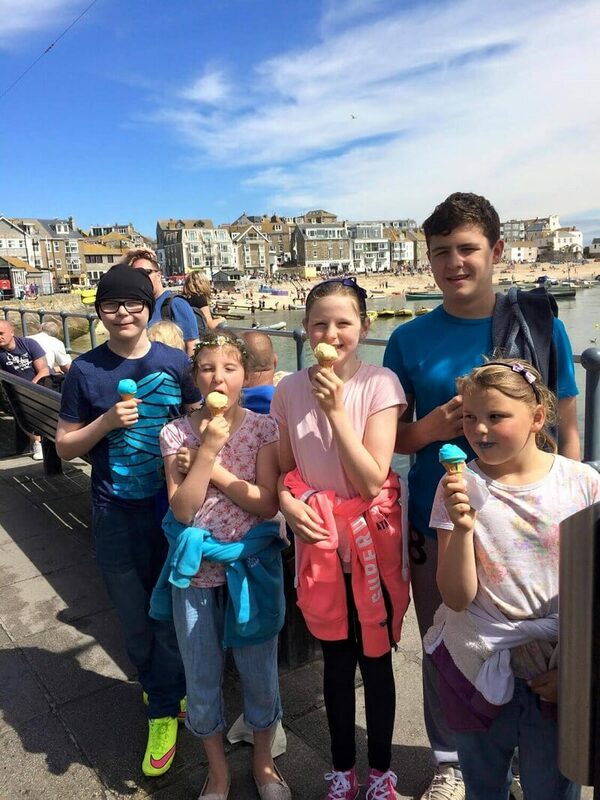 Much to our joy, and to the shock of those that sponsored them, these amazing 9 years olds swam over 17 miles between them in the allotted hour and raised well over £4000 for the Safari Ward at Great Ormond Street where Molly was receiving treatment. It was such a joyous and inspirational day. 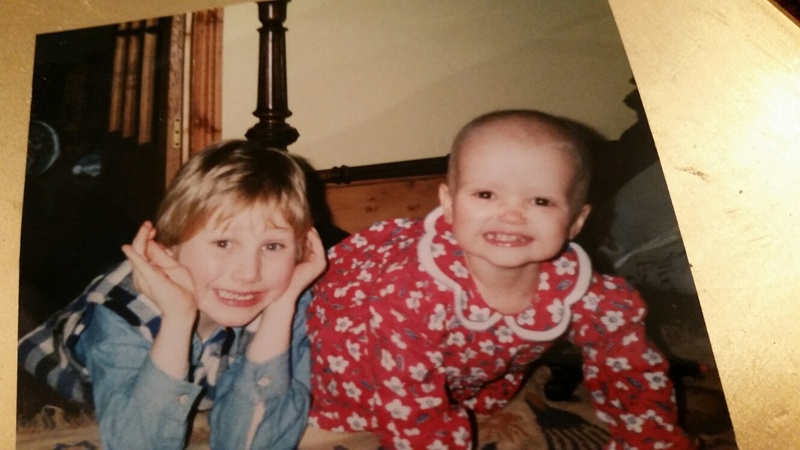 Molly was surrounded by her friends and was cocooned by their love and support and it made her, and us, feel wonderful and wonderful is a rare feeling where cancer is concerned. This is my beautiful daughter Ruby holding her little sister Willow for the first time. 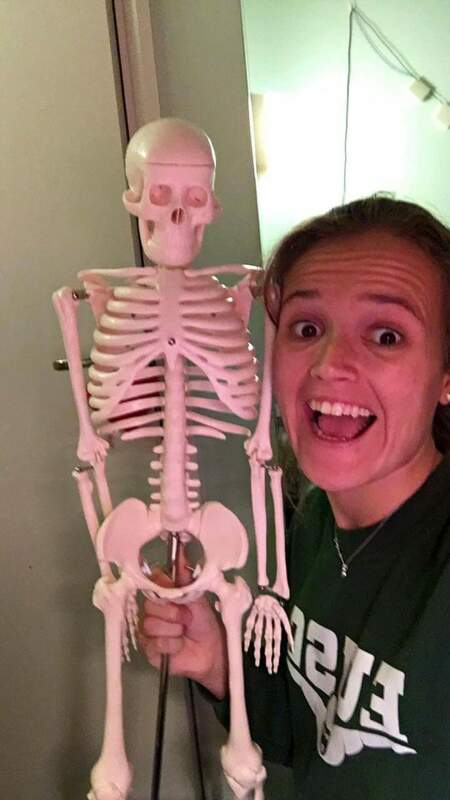 The doctors were unsure if her remaining hip bone would take the weight of her body and could give no reassurance she would be able to stand or walk again. 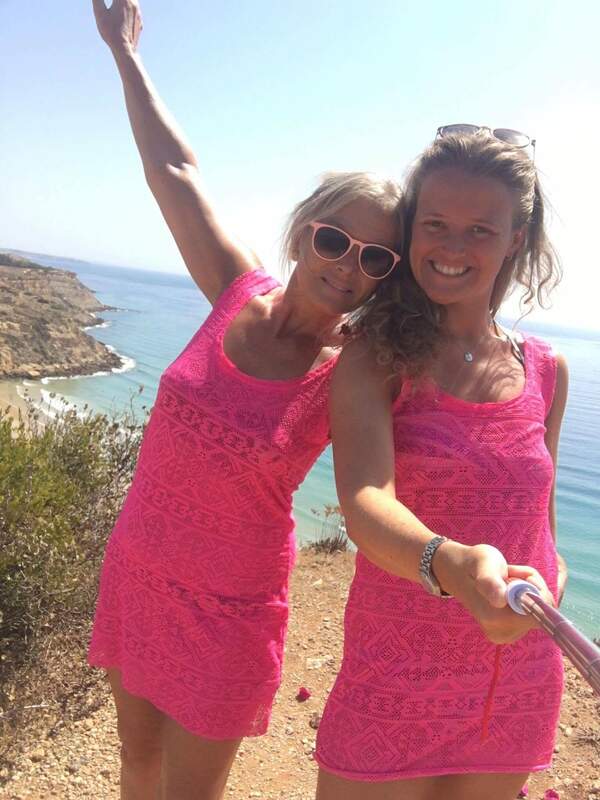 Keeva spent 14 weeks in a hip spica plaster cast while her muscles healed. When the hip spica was removed at the end of March 2017, Keeva bravely took her first new steps. This reassured us her leg could take her full body weight. She then under took weeks of gentle stretching exercises and assistance using a walking frame. She was more mobile but still needed assistance as she would walk approximately 20 steps. Then the next sessions of physiotherapy built up her strength and helped her to walk again. I am glad to let you know she is excelling in her rehabilitation and now able to take 1000+ steps. 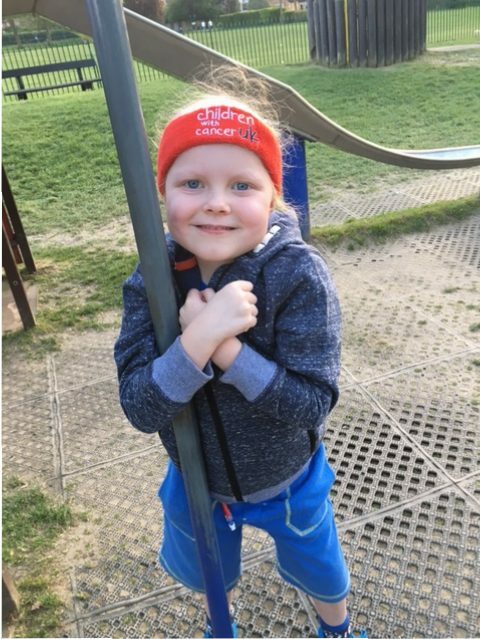 Keeva is proudly wearing herCchildren with Cancer UK headband as we are all supportive of the wonderful work your charity undertakes, and have been privileged to attend your family days out. We spent Christmas in hospital waiting for results and it was confirmed in mid January treatment began straight away and we spent a further 2 months in hospital. 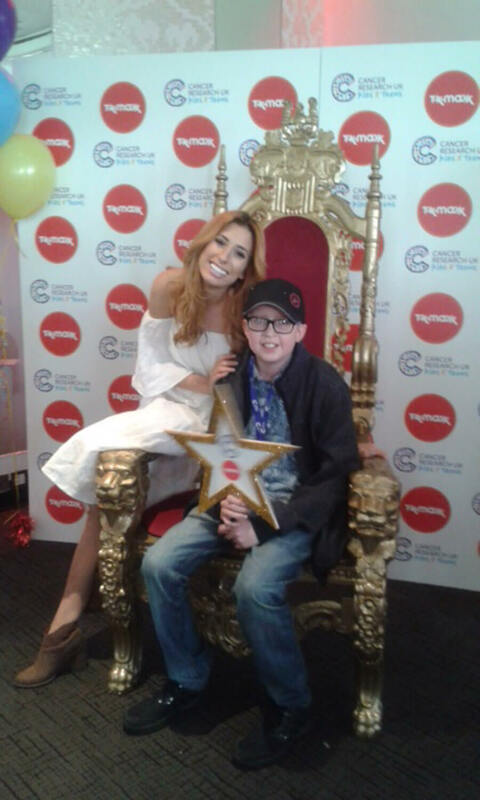 Michael was extremely lucky with treatment and it was as kind as chemo could be to him and he won ! 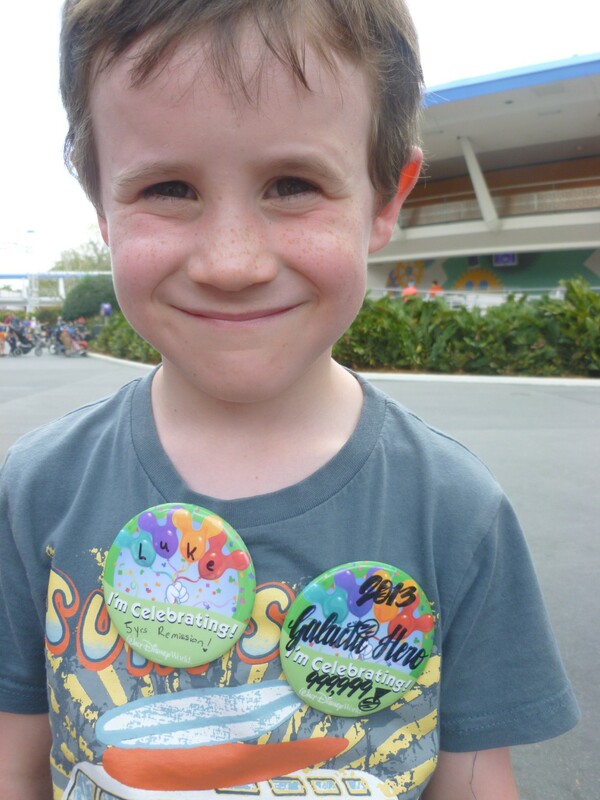 He had his Hickman line removed and this has been the start of him celebrating his life. So many golden moments for us to mention! 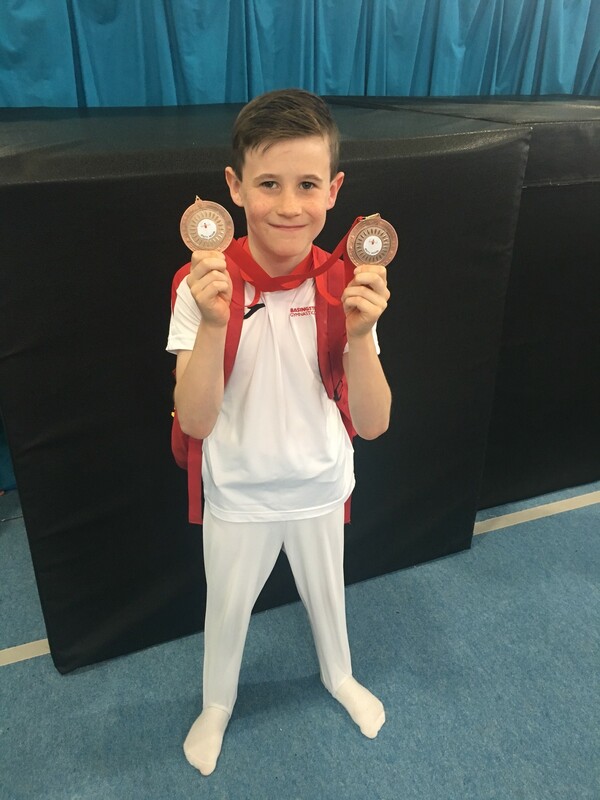 I think there are a few extra special times that I’d like to mention – first day at school, special trip to Disney World to celebrate 5 years in remission, when we swam with a dolphin last year and more recently, when he was placed 3rd in the South and also represented the region in a National Elite Men’s Artistic Gymnastics Competition. All these moments and many more, are special for any parent but when a child has been through so much and was not expected to survive, it makes each moment like this, extra special. 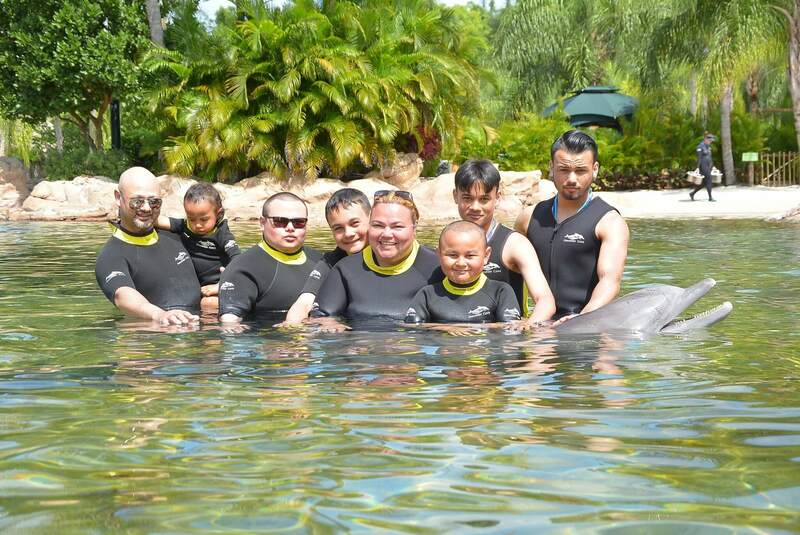 Our golden moment as a family was a holiday to Florida where we all had time to relax and enjoy each other without worries but the best part was seeing Dylan’s wish come true where he got to swim with dolphins. He loved every minute of it and his smile was infectious! One of Dylan’s golden moments was having the Sun newspaper come to our home just before Christmas with a huge amount of toys and games, he wasn’t expecting it so he was completely surprised! He’s had so much pleasure with the gifts he received and they’ve help combat his boredom while being unable to attend school. The shock on his face when he walked into the room was priceless and such a joy to see. 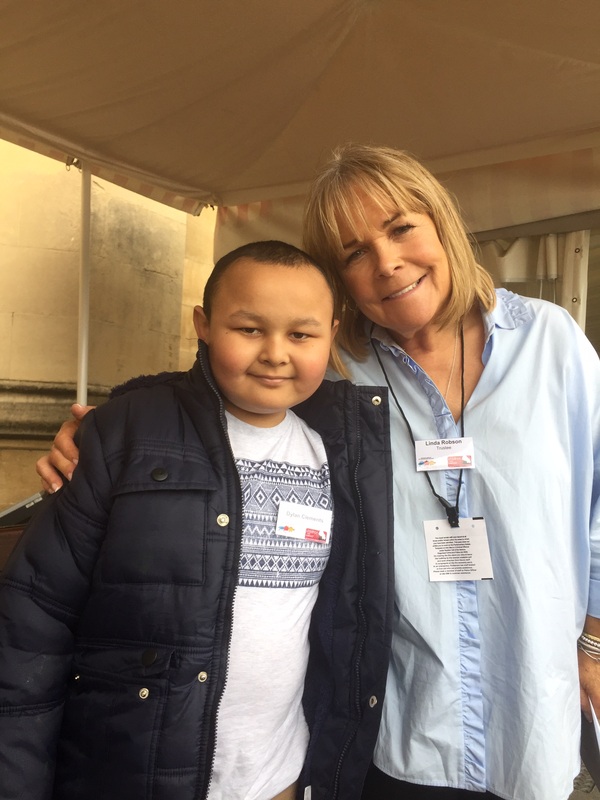 Another golden moment of ours was a visit to the Houses of Parliament where he met one of his favourite celebrities, Linda Robson. Dylan was star struck and Linda was absolutely brilliant with him and made him feel so special and important. 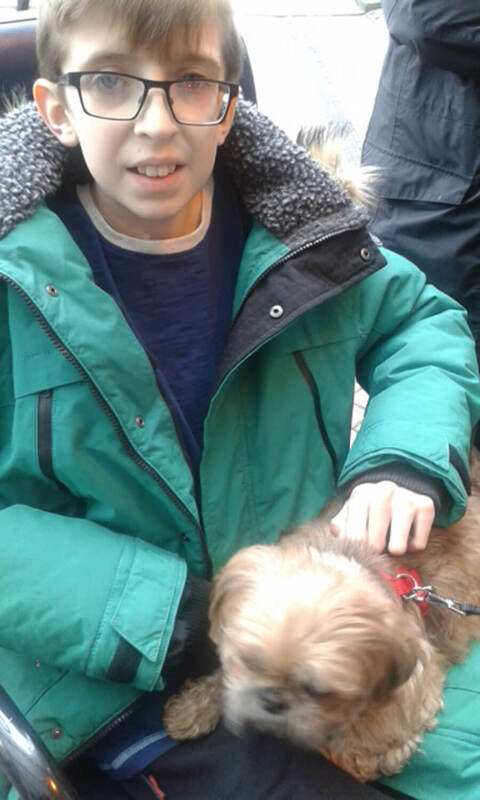 He’s a great fan of birds of a feather and has often seen Linda on loose women (while off school) so meeting her was another wonderful moment on his cancer journey. 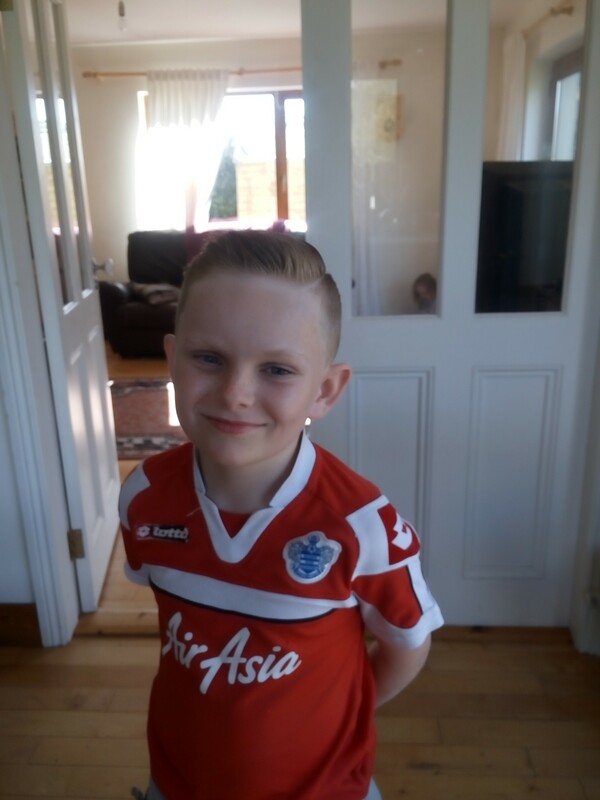 Kalem requested no presents, and asked for charity donations instead, a very very proud moment for me!! 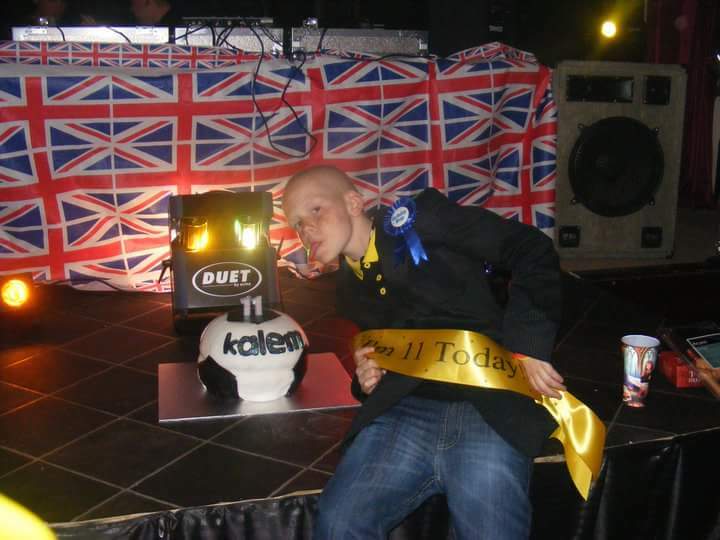 One of my golden moments during Kalems treatment was him celebrating his 11th birthday & his remission with a big party, Kalem requested no presents, and asked for charity donations instead, a very very proud moment for me!! 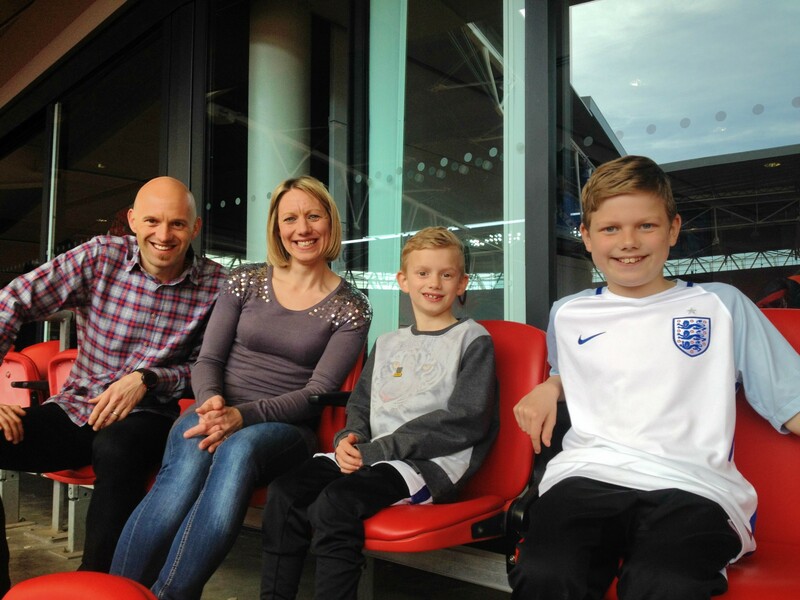 One golden moment was when we went with Children with Cancer UK to watch England play at Wembley. That would’ve been a golden moment on its own, but we got treated to watching the match from a box with 3 course meal and drinks too! We had such an amazing time and talk about it often. Isaac is a keen runner. The gruelling treatment has meant that he has not been able to do very much exercise and certainly not be able to perform at any level. However he has been determined to not let illness or the treatment stop him. 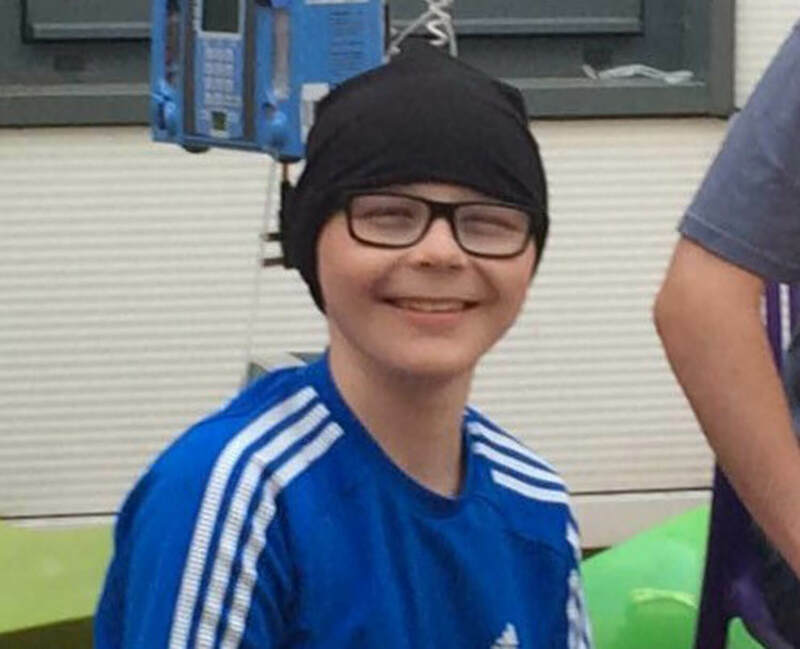 A golden moment was him completing every race at Sports Day whilst in the middle of very intensive chemotherapy not worrying about the fact he couldn’t compete with others but with a massive smile on his face because he was there. Another golden moment with regard to his running was his first club race back whilst in maintenance. Again, not because of the time he ran, as he is still on daily chemo, but because of the joy he had as he could run. 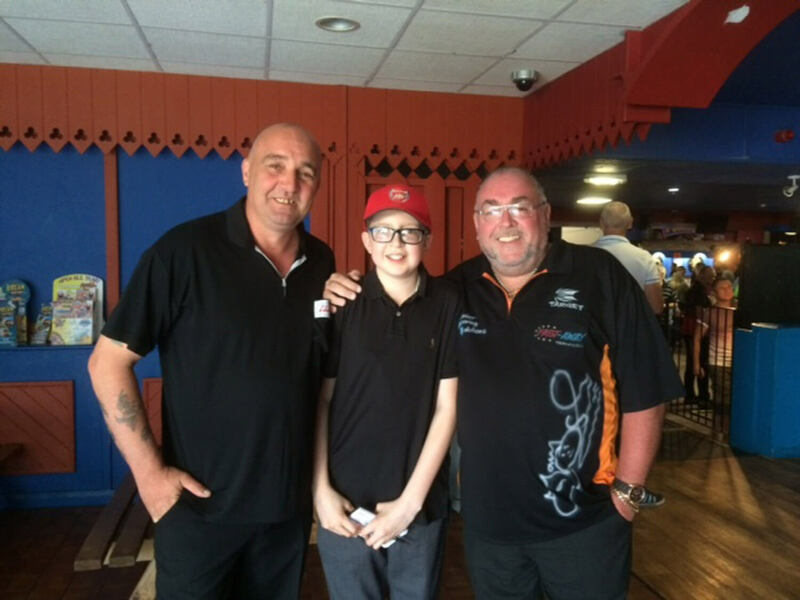 Even during treatment Isaac was determined that he could do an event to raise money for children’s cancer charities. 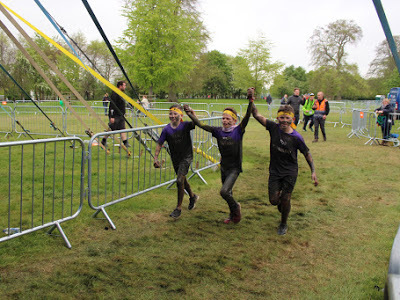 He, his brother Noah and 2 friends completed the Rat Race 6k Young Mucker muddy run. It was a golden moment watching the brotherly comradery as they worked together to get Isaac to the finish crossing the line hand in hand arms aloft. 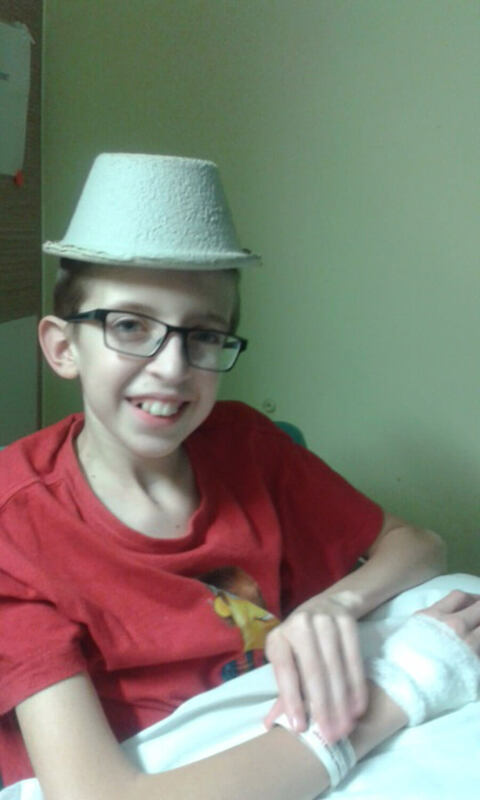 Isaac was due to compete in the Junior Race at the Great North Run in 2016 but was then diagnosed and in intensive treatment so had to withdraw. However Great North Run organised for him to be one of the official starters of all the junior races! What a golden moment! 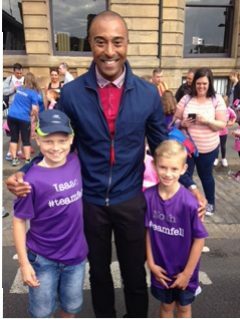 Not only that but we ended up having an interview with Colin Jackson! 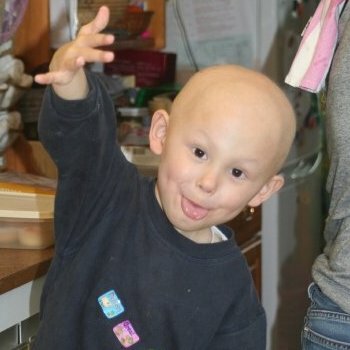 Isaac’s treatment is in 5 phases. We have celebrated the end of each phase with a meal out to mark the significance of moving on towards recovery. He is now in the 5th and final stage. Each meal out has been a golden moment as it has been a focus for getting through tough times and so anticipated. 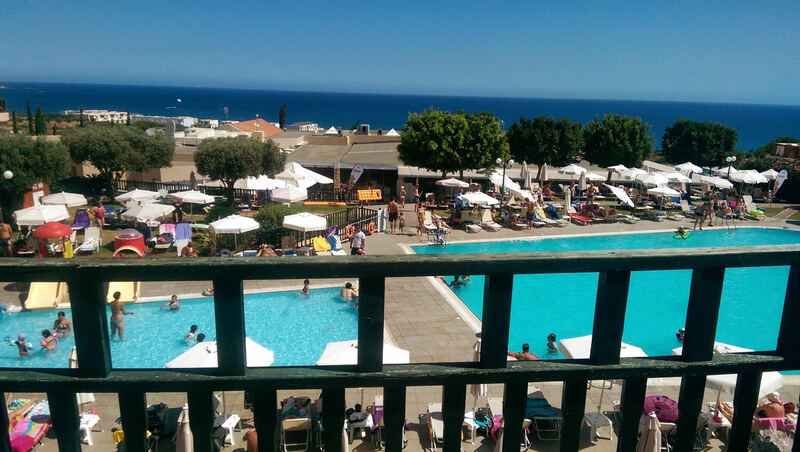 He isn’t allowed abroad for the whole of his treatment (3 1/2 years), so our really anticipated golden moment will be at the end of the 5th phase when we get to go to have 5 meals out at Isaac’s 5 favourite restaurants in Cyprus, where Isaac’s grandparents have a property and we have shared many a happy family holiday. He's is so brave and has come so far! 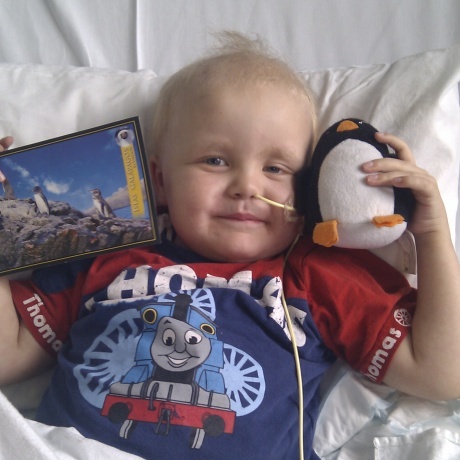 Owen was diagnosed with Stage 3 Wilm’s tumour in February 2014 and there were so many golden moments during his nine months of treatment. 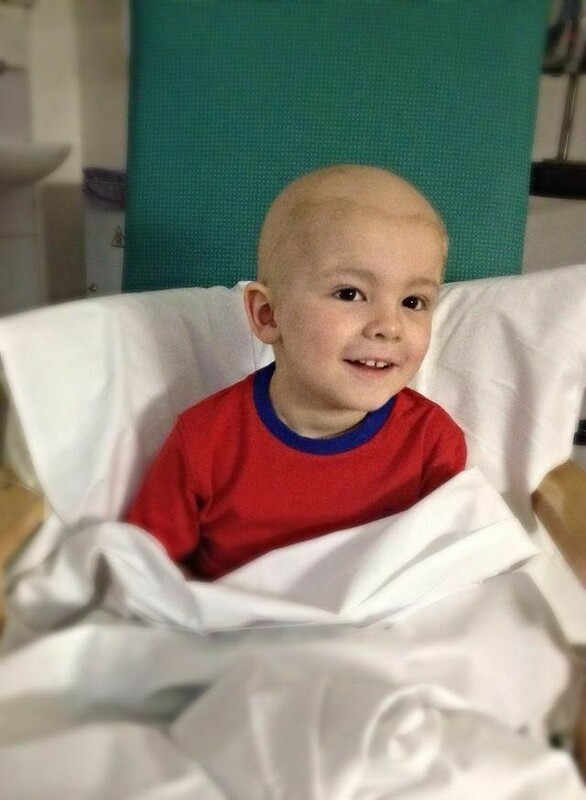 The first being Owen’s remarkable recovery from the six hour complex operation to remove the tumour. 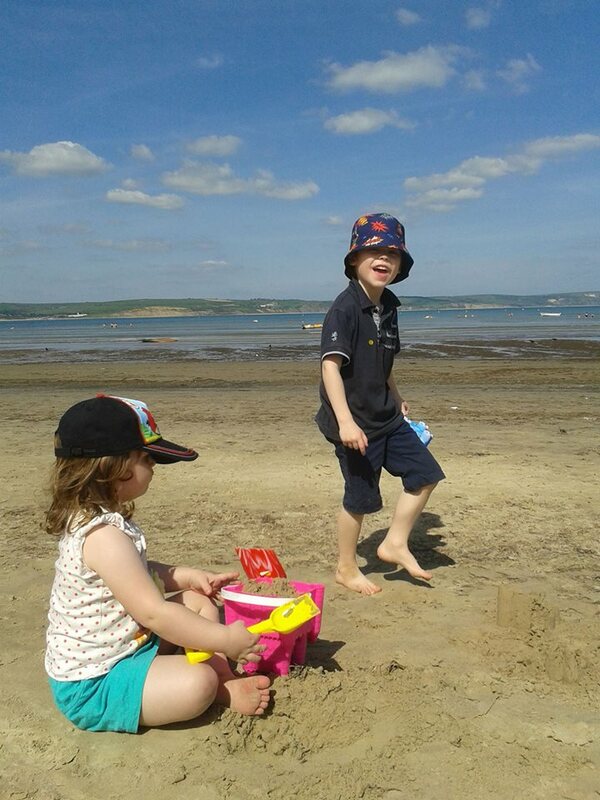 Another was the time when we managed to escape to Weymouth for a short break inbetween treatment, watching Owen play on the beach with his little sister Lily, making sandcastles and dipping his feet into the sea. The day when Owen ate a whole meal without feeling unwell and the joy of seeing him return to school even when he was still on treatment. 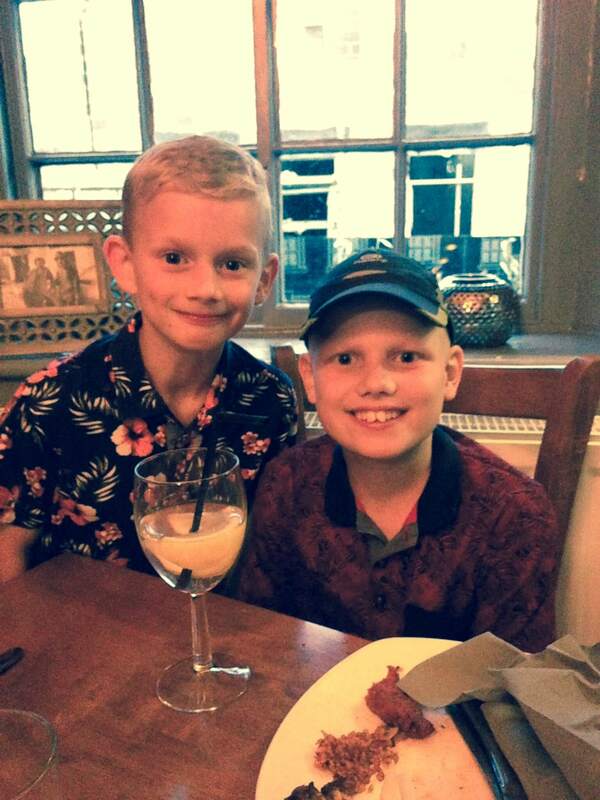 Owen’s remission party/charity fundraiser and being overwhelmed with everyone’s support, help and generosity. Most importantly Owen surviving each day, he’s three years in remission and like any parent every moment should be cherished, recorded and remembered. 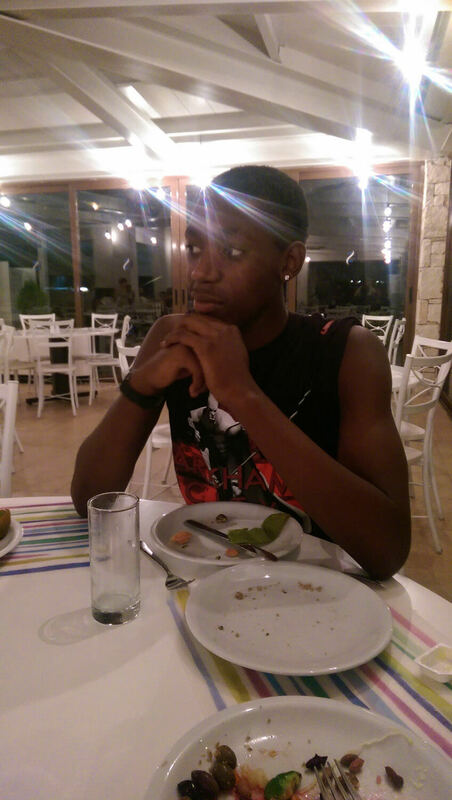 He is doing brilliantly, he's happy, healthy, loves sport and is in the school quiz team. 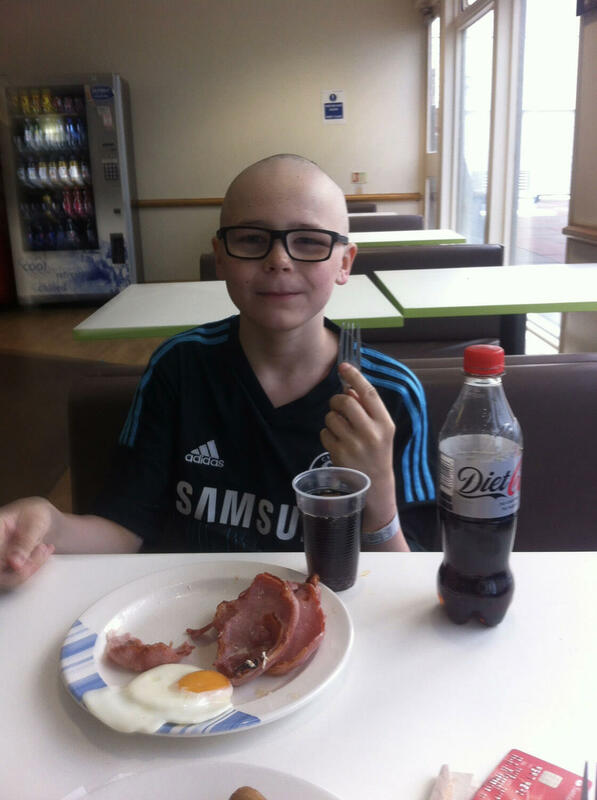 This is Francis he is 10 years old and is in four and a half years remission from Rhabdomyosarcoma. He is due his last MRI scan in October and looking to get the all clear. He had seven months of chemotherapy and went to Florida for Proton Beam Therapy. 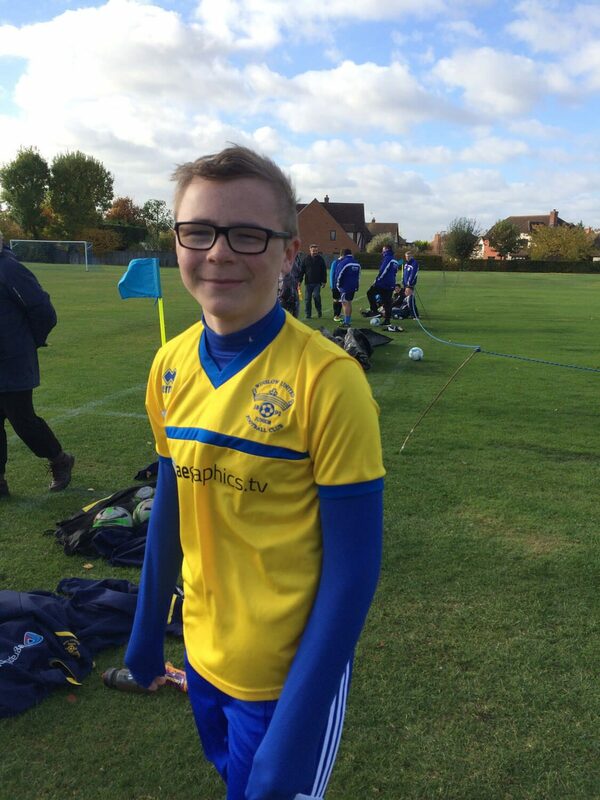 He is doing brilliantly, he’s happy, healthy, loves sport and is in the school quiz team. 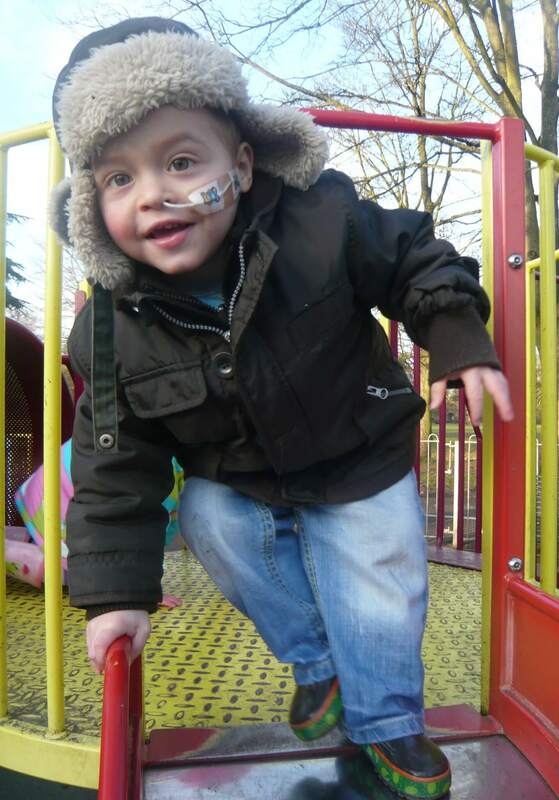 The most memorable golden moment for Louis was a week after his chemo had finished he decided to take the nasal gastric tube out of his nose. His weight dropped significantly at the start of treatment and Louis was admitted for re-feeding. He was very weak and poorly at that point. We had felt very stressed about how little Louis was managing to eat and how much weight he was losing each week. As soon as the tube went down we never looked back. He had a night feed every night for 3 years which gave him all the calories and nutrients that he wasn’t able to eat himself. The stress was instantly removed. We always offered him a meal but he very rarely ate anything. We only thought he would have it in for a week or so, but his eating never picked up and he had it in for the duration of his treatment (3 years). 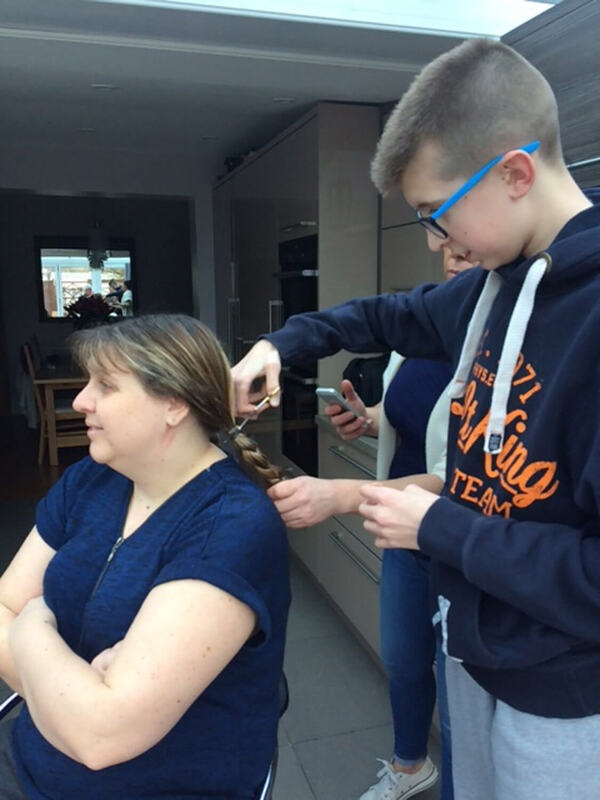 A week after his treatment had finished he got up one morning for school and I said to him “Louis, shall we take tubie out today?” He replied “OK mum”. With that I pulled it out, he walked to the mirror and when he looked into it he said, “Now I look like everyone else mummy”. It was a very emotional milestone for all of us. He then ate nothing but pancakes for several weeks until one day I said we had run out of eggs! Slowly but surely he started eating again and gaining weight. He is now 9.5 and eats constantly and always asks for seconds. 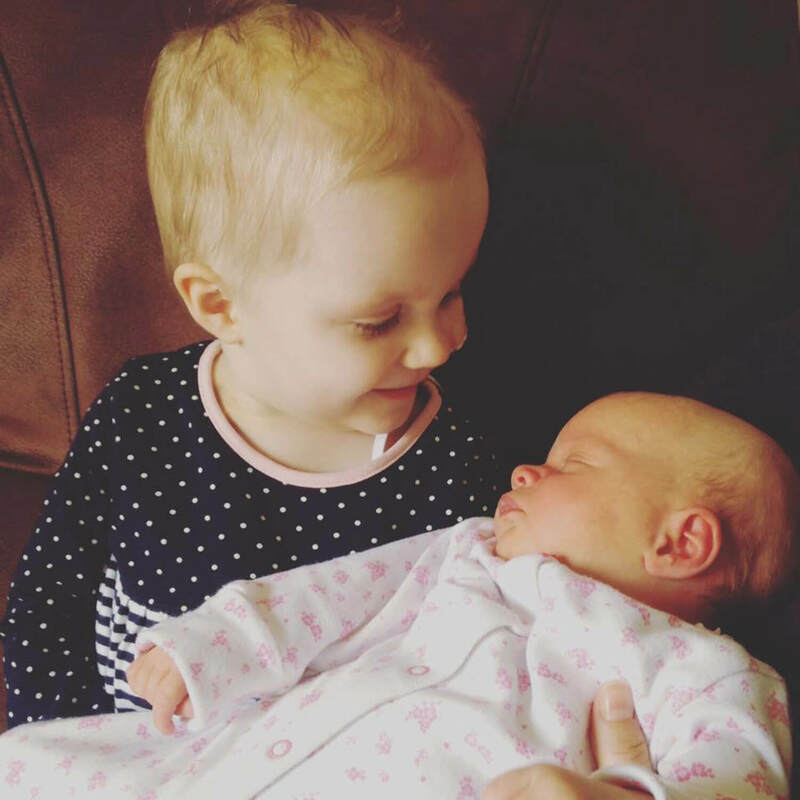 Maisie was diagnosed with ALL aged 14 months having been a healthy and happy baby. Her treatment spanned 4 years as delays occurred due to multiple infections and severe reactions from chemotherapy. Maisie s journey has been amazing and it has been a privilege to have been apart of and to have been alongside her and to witness her sheer determination and the happiness and joy she has found in achieving as she has grown and overcome so many difficulties to become a successful, confident, popular and happy 23 year old adult! Golden Moments are many and they still keep on coming! 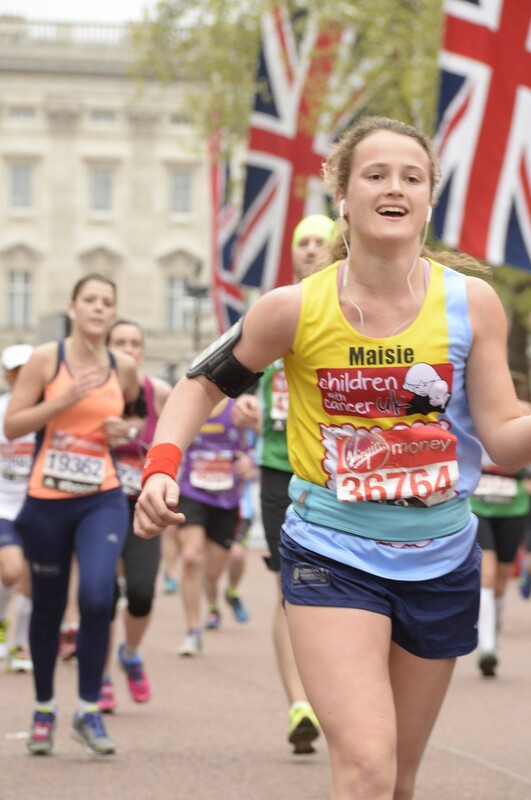 During treatment Maisie suffered from an episode of encephalitis. This meant two months of draining fluid from her brain and scans revealed damage to nerves. We did not know if our daughter would ever walk or talk. 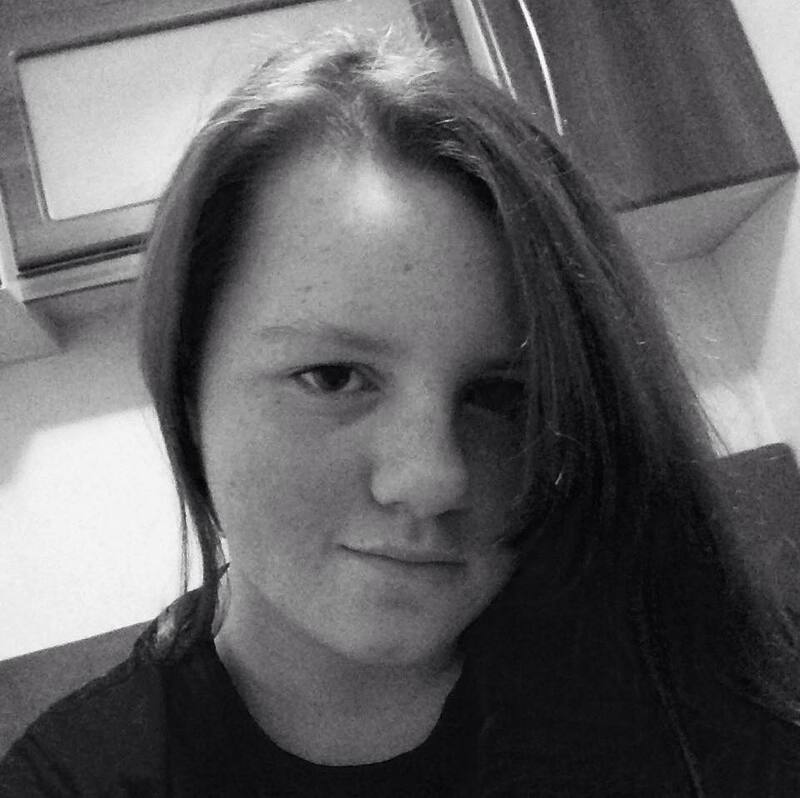 Maisie had intensive physiotherapy and learnt sign language. My greatest Golden Moment has to be on her brother’s school sports day when she decided that she wanted to run in the sibling race. She was wearing splints and needed her brother and father to hold her hands as she could not stand unaided but her smile said it all. The whole school was cheering her on and the photograph is a little grainy but this is a moment I will never ever forget! Maisie attended a playgroup for children with individual needs and she learnt to communicate with sign language. She enjoyed her time here and liked to be outside. She had her eye on the tricycle and so we sat her on it and helped her to push her feet onto the pedals…..suddenly out canes the words “Faster, faster”, very clear and with sheer determination she got the tricycle moving by herself!……we had to find another nursery….mainstream here we come! Maisie went to school where her brother Jack was but it was difficult for her to move around the building and the classes were large. Due to low immunity she had several warts on her face and children are not always kind. 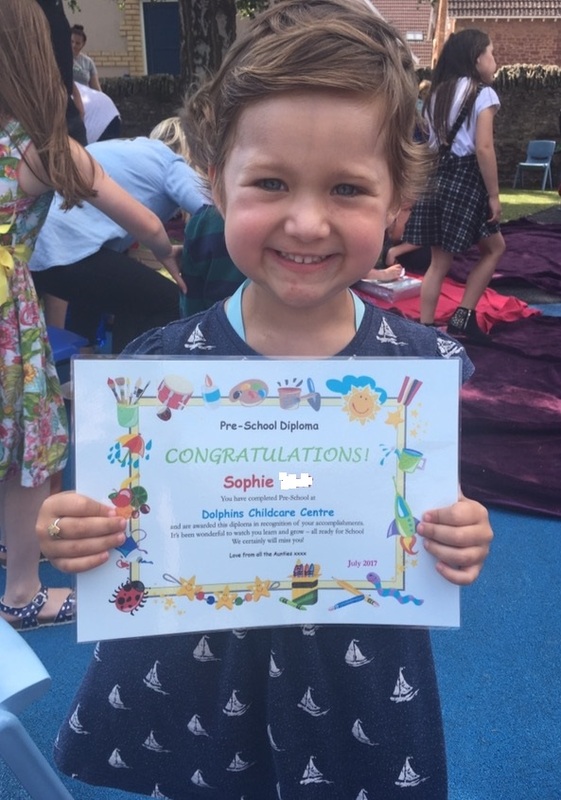 On the advice of an educational psychologist we moved Maisie to another school with smaller classes and moved her back a year to give her a chance to get the foundations of her primary education in place. This was a hugger and difficult decision to make. 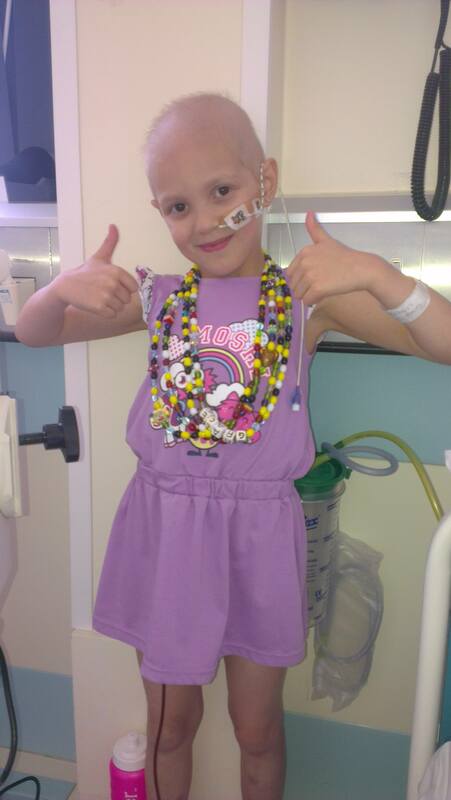 The school were honest with us that ”tis would be the best portion for Maisie . 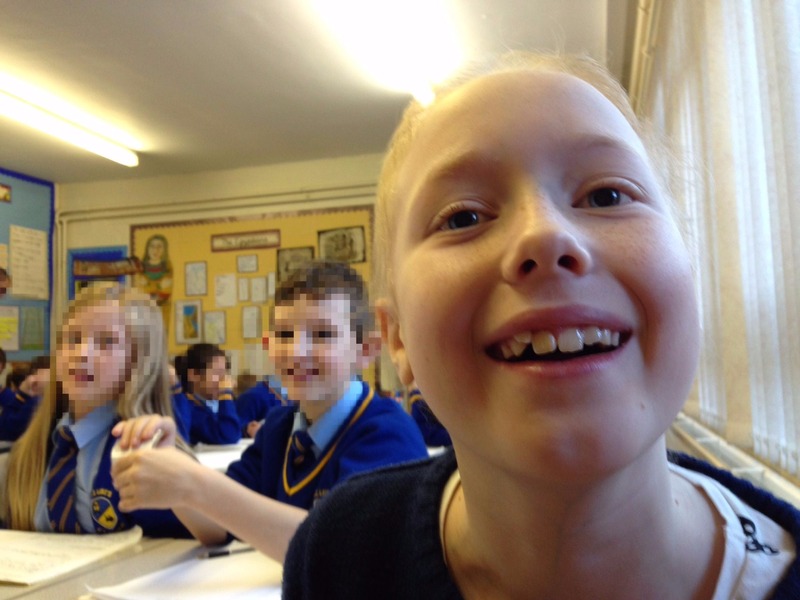 Prior to starting her new school, Maisie had all her warts frozen from her face, in one go. 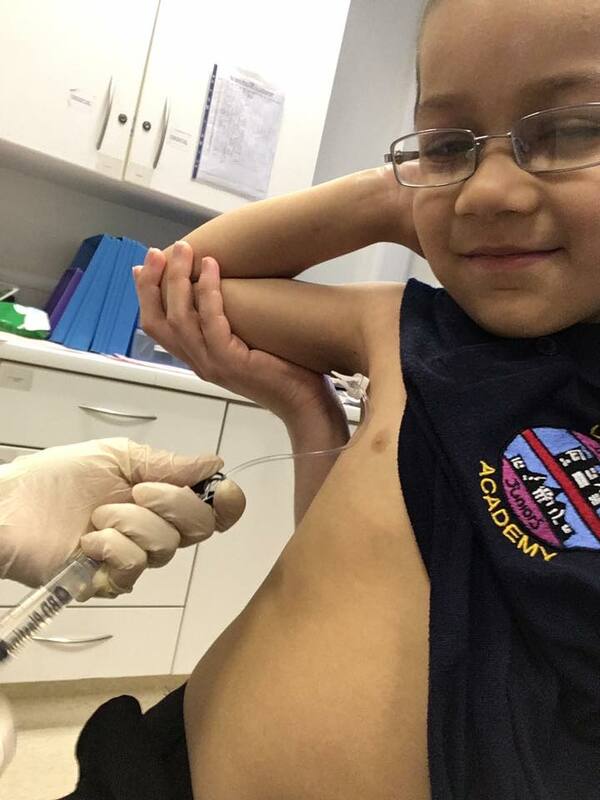 The consultant said she had never known a child manage to cope with this much pain in one session……Maisie is made of tough stuff and she was now 6 years old and determined to begin her new school wart free! 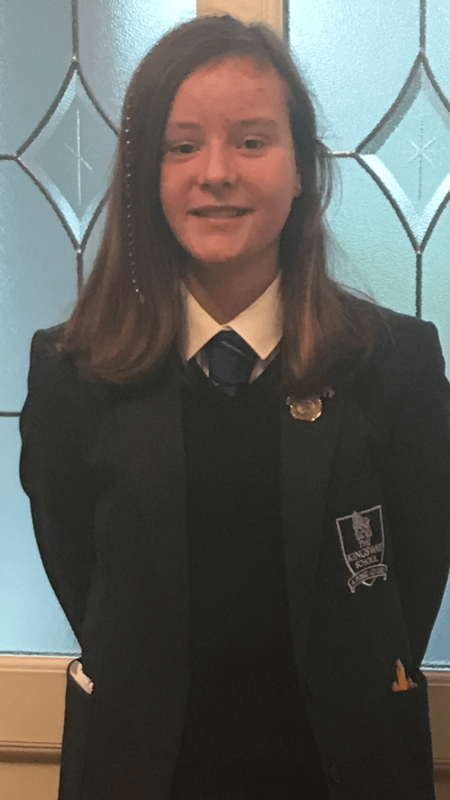 The school move was exactly right and Maisie thrived in all areas, academically, in sport, ballet, tap and modern dance, elocution and music…. fantastic considering we weren’t sure if she was going to ever walk or talk let alone achieve exam standard. Age 13 Maisie passed an entrance exam to boarding school, entirely her choice, and followed her older brother to full time boarding. This is where Maisie thrived. She threw herself into everything and made the most of every opportunity. Each parents consultation felt like a dream and we could wish for no more. A really special moment was watching Maisie in her first school play. It was totally brilliant and she got the part having auditioned. Maisie was also asked to co direct her house play which is a real honour. 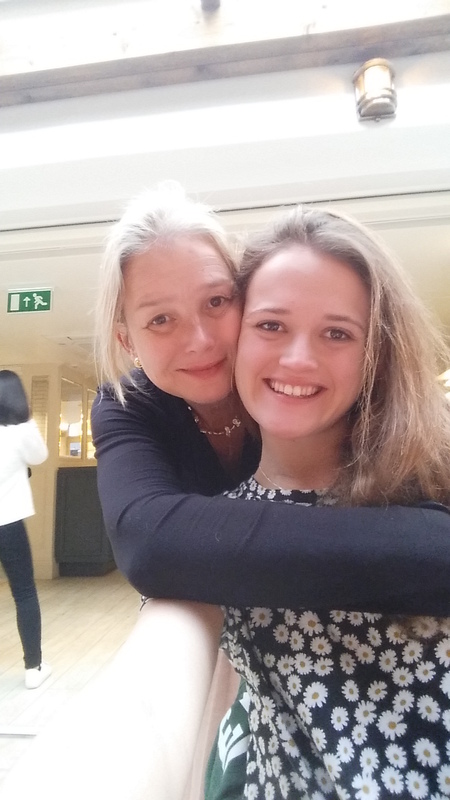 IGSE results were fantastic and in 6th form Maisie was made the prefect for pastoral care. 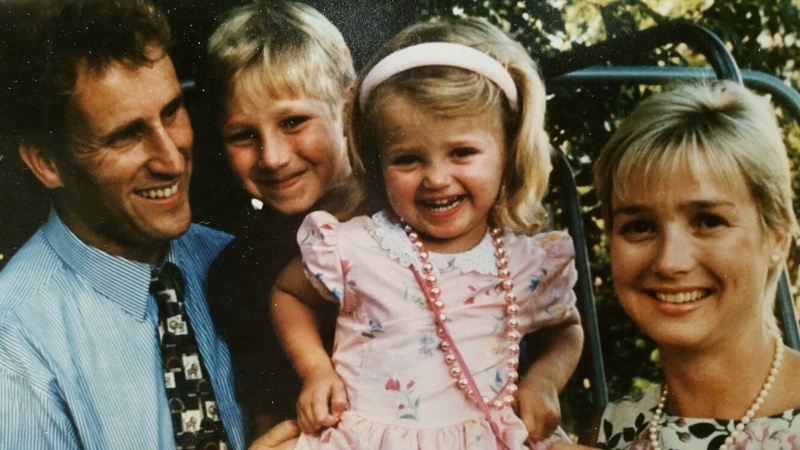 After A Levels Maisie went to University of Exeter to study bio medical science and chemistry and gained a 1st class degree with honours with a Deans commendation…..words can’t explain how as a family we felt. So so delighted for our daughter. MY MAISIE IS GOING TO BE A DOCTOR !!!!!! Talk about amazing……and it is because of all the people who helped her to be well….she is going to do the same. 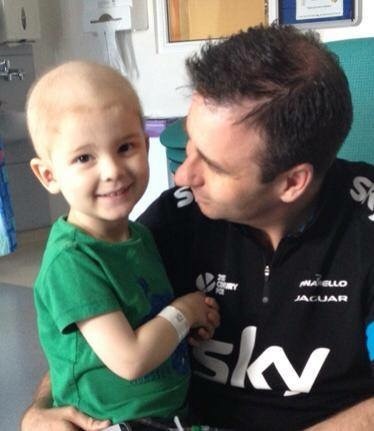 I also must mention that Maisie s illness had a big impact on the life decisions made by her older brother Jack. He was 5 years when Maisie was unwell and three years ago her qualified as a doctor and we are extremely proud of him. 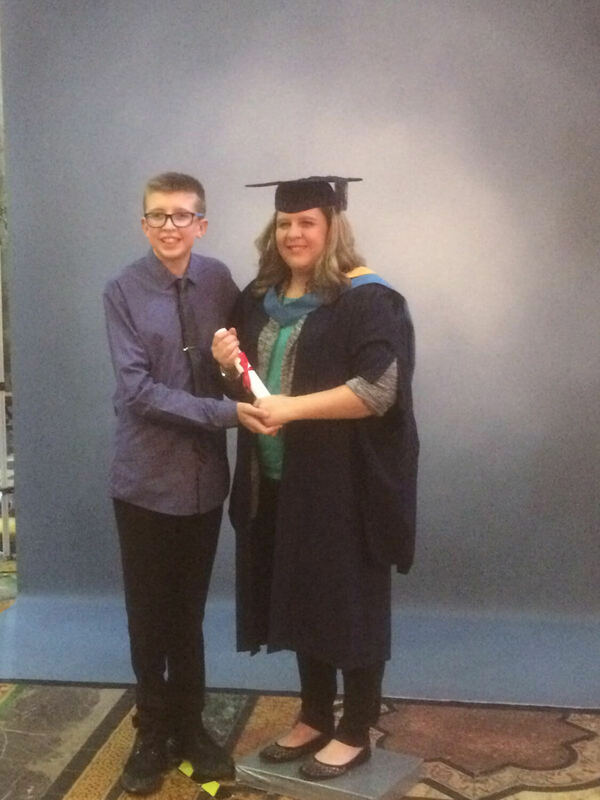 As parents we hadn’t expected that Maisie s illness would have led to Jacks decision to become a doctor. So we are extremely proud that our children have chosen to help others in this way and have worked extremely hard to get where they are. 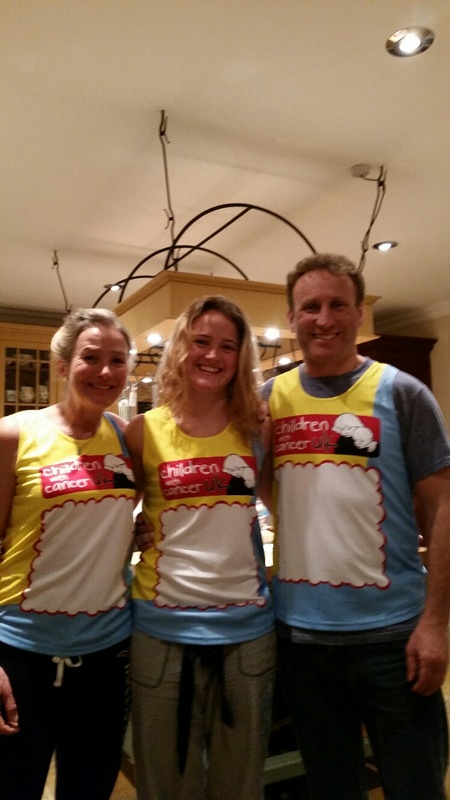 In 2015 Maisie, her dad and myself ran the London Marathon for Children with Cancer and raisins nearly £5000. 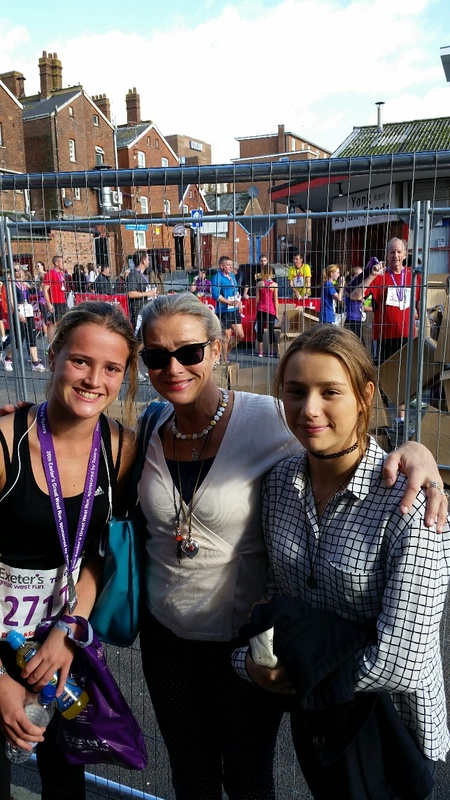 It was totally amazing to run this with our daughter who 20 years ago was not expected to walk! She finished quite a long time before her parents! Since the Maisie has run several half marathons and in October this year is running in the Budapest Marathon, last year it was Paris. 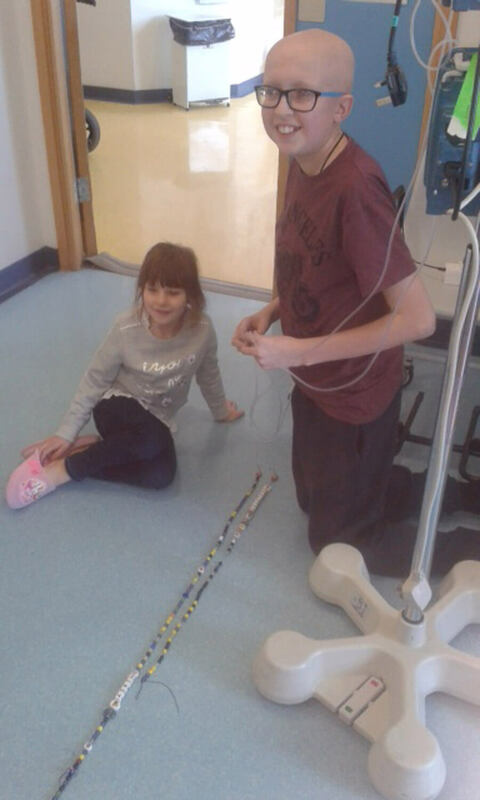 Maisie asked him to write this as she was so young when she was ill she has very few memories of being in hospital. Only that we, her parents, brother and grandma were there and she remembers her named nurse, Louise, as even after all these years we are still in contact even though she lives in Australia. ‘Your son has leukaemia’. What does a parent say to that? My son Alex was just three years old when the doctors told us he had to be put into a medically induced coma. 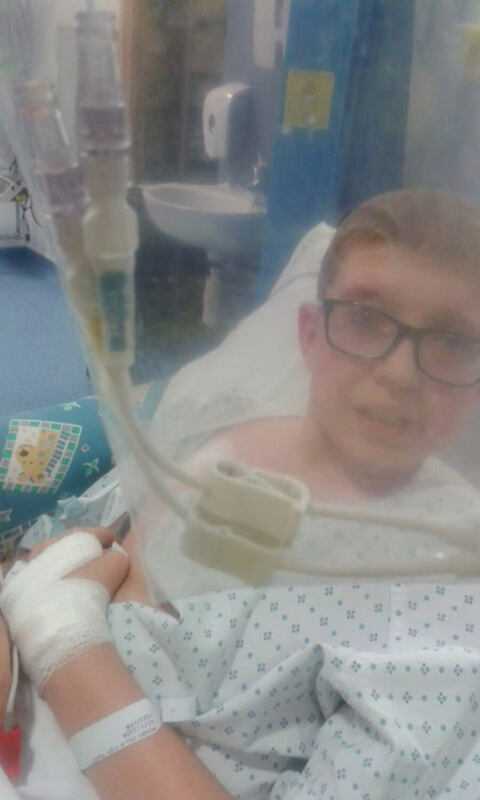 They said Alex’s blood was like treacle and that he only had a five percent chance of survival. We prepared ourselves for the worst. 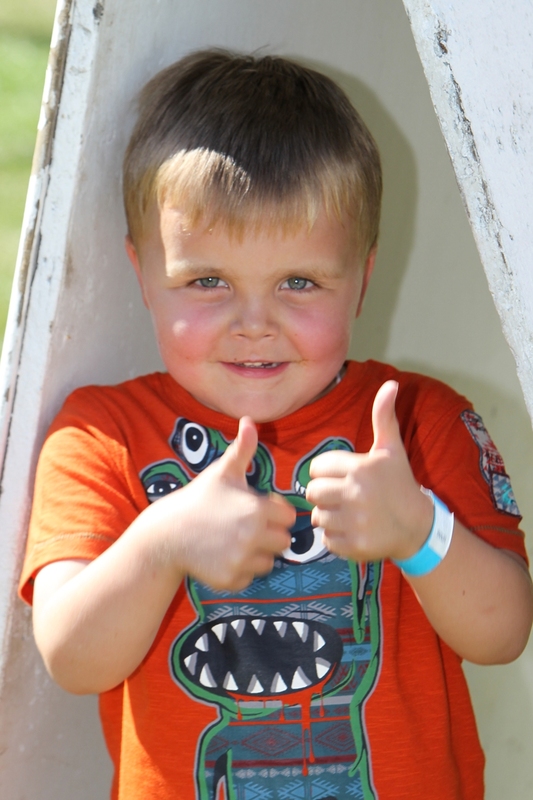 Thanks to new treatments made possible by research my little boy Alex woke up from his coma. But for the next two months he didn’t say a word. Then one morning something wonderful happened. I heard Alex say ‘I love you mummy’. The floodgates opened and I burst into tears. I know this isn’t the end of Alex’s fight against cancer. But now the memory of my sweet little boy’s voice will help me get through whatever we face together. 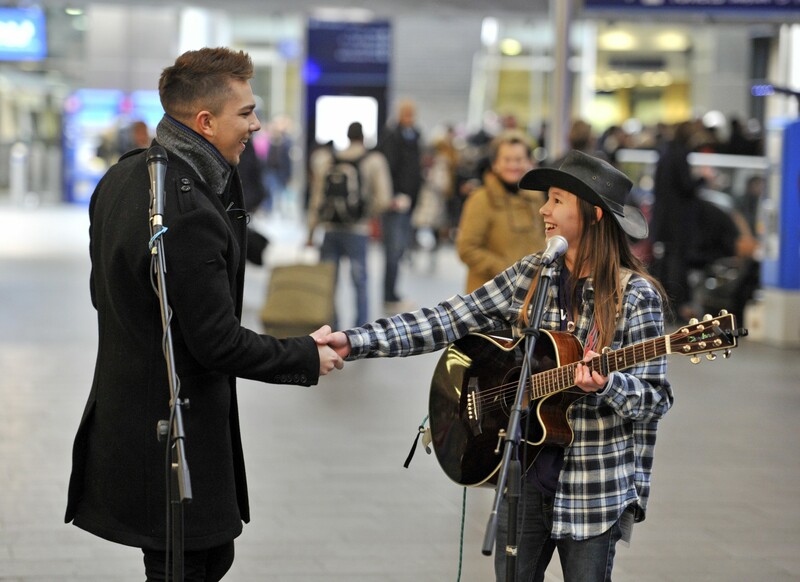 I will share this memory with Children with Cancer UK to help them celebrate the bravery of children affected by cancer. They are asking people like you and me to share ‘Golden Moments’ like these; the happy memories that help us through hard times. - acute lymphoblastic leukaemia (ALL). 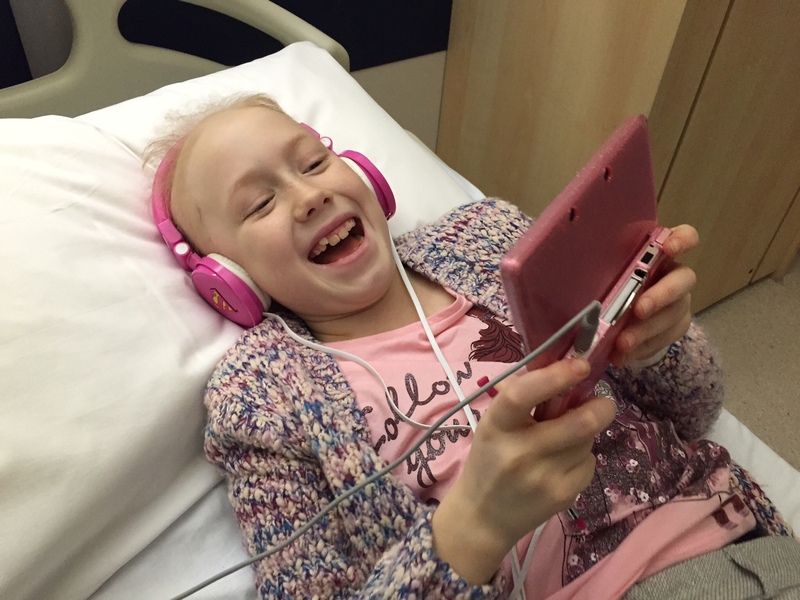 During her treatment we had been on a few family holidays in the UK but on 2 of them Elizabeth spiked a temperature and had to spend a night in the local hospital to where we were staying. 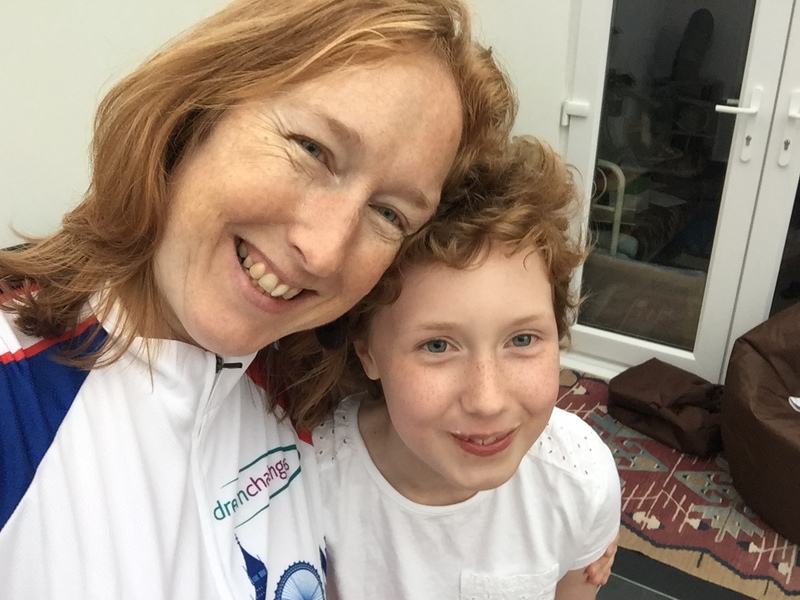 When she was nearing the end of her treatment, the mum of another child in the cancer ward at Oxford suggested that I contact a charity about trips for children going through, or having just finished treatment. (I am ashamed to say that almost 10 years later, I can’t remember which charity it was). 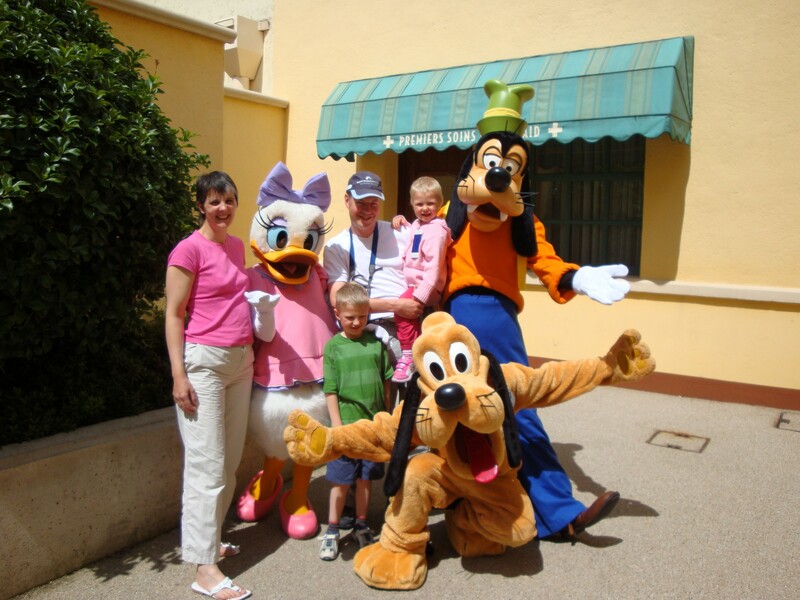 We were lucky enough to be given a short break in Disneyland Paris which was the first holiday abroad for Elizabeth. 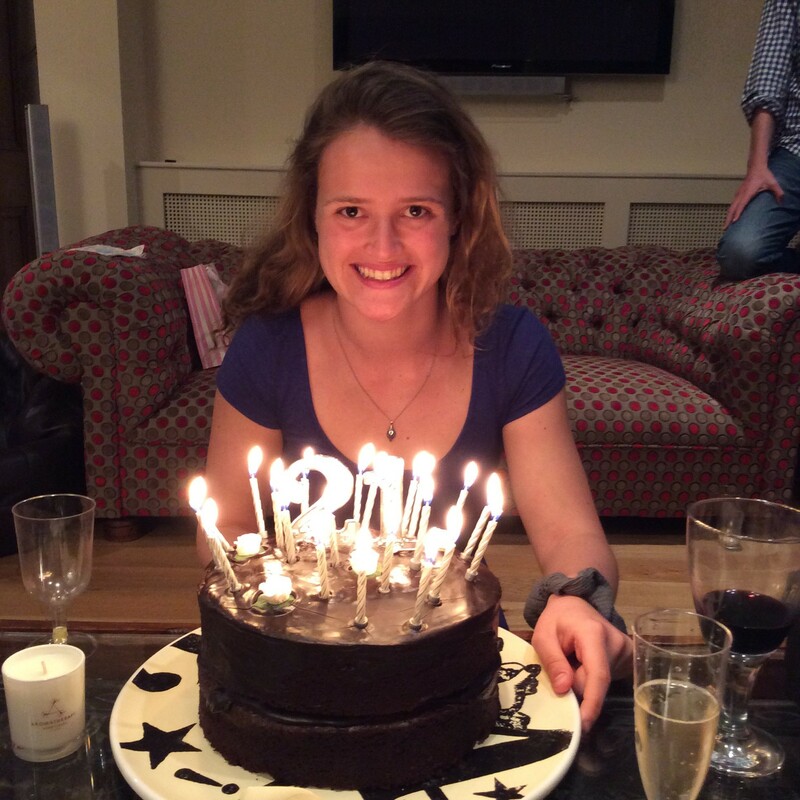 We all had a great time and Elizabeth, as well as her 2 brothers, were thoroughly spoilt. Her hair had begun to grow back and the only thing that gave away that she had been through something, was the huge blue badge which she had to wear and which meant that she was treated like a princess by all of the characters. 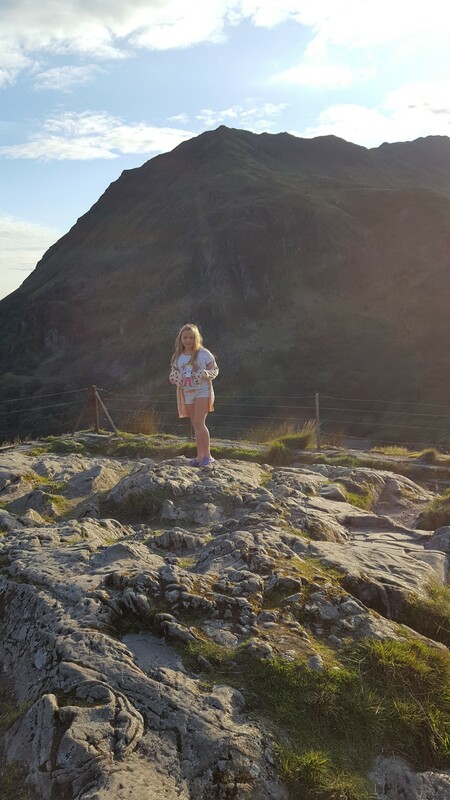 Last week in Aug 2017, we were in Wales and Erin climbed Mount Snowden. Just before we left Erin had an appointment with her cardiologist and had a heart echo to make sure the condition she was left with after the chemotherapy was not going to get any worse. We were given the all clear to try but not to be disappointed if she didn’t make it. Well she did make it all the way to the top. 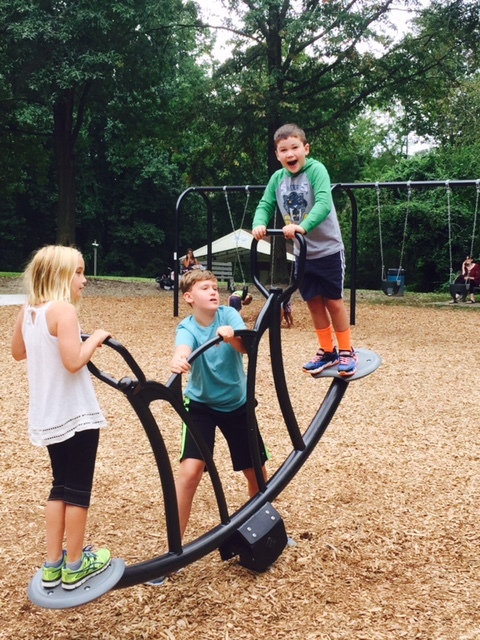 We were absolutely amazed – I kept looking at her while she was climbing and thinking to myself how strong and determined she is. I was so proud of her and her sister for doing it. 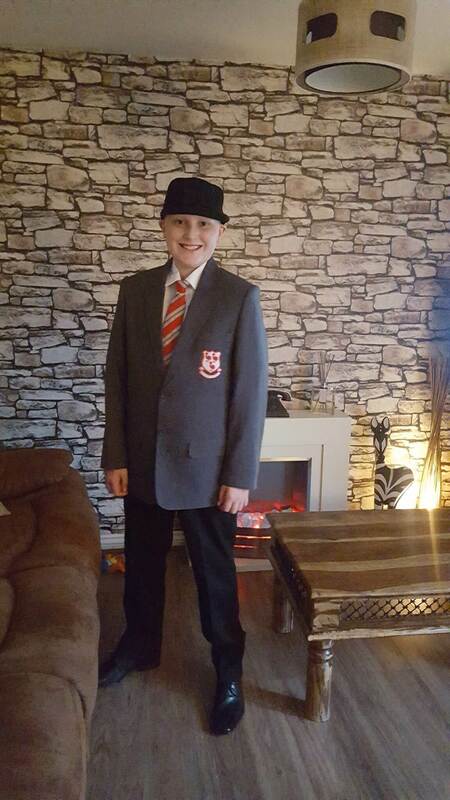 My son Aaron on his first day at secondary school today (05/09.17). 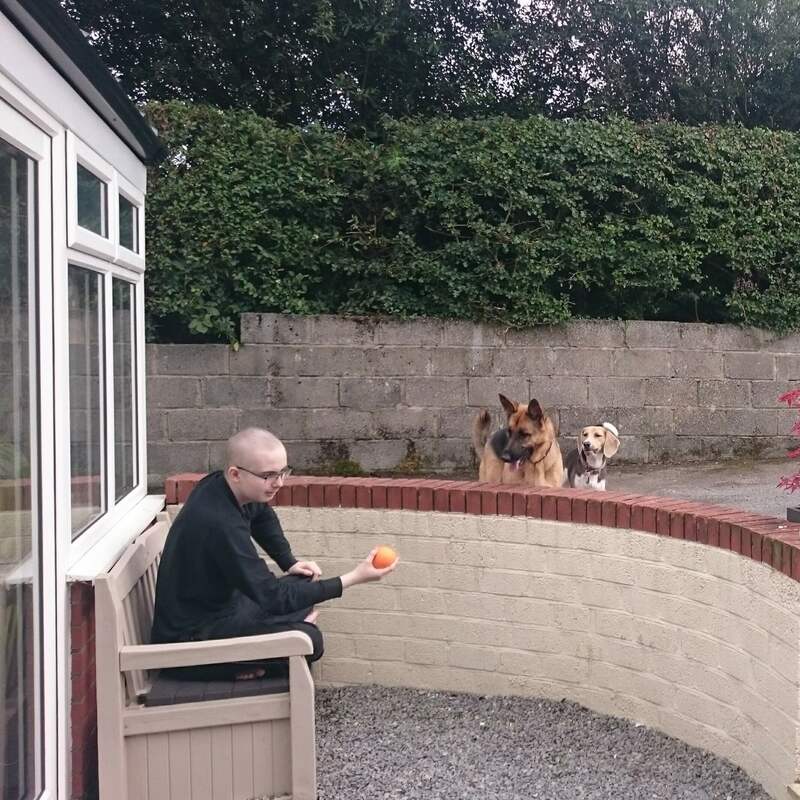 Aaron was diagnosed with T cell Lymphoma in December 2016 and hasn’t managed a full day at school because his treatment was so intense (sometimes we were at hospital five days a week) intense treatment finished two weeks ago and now we have two and a half years of maintenance. 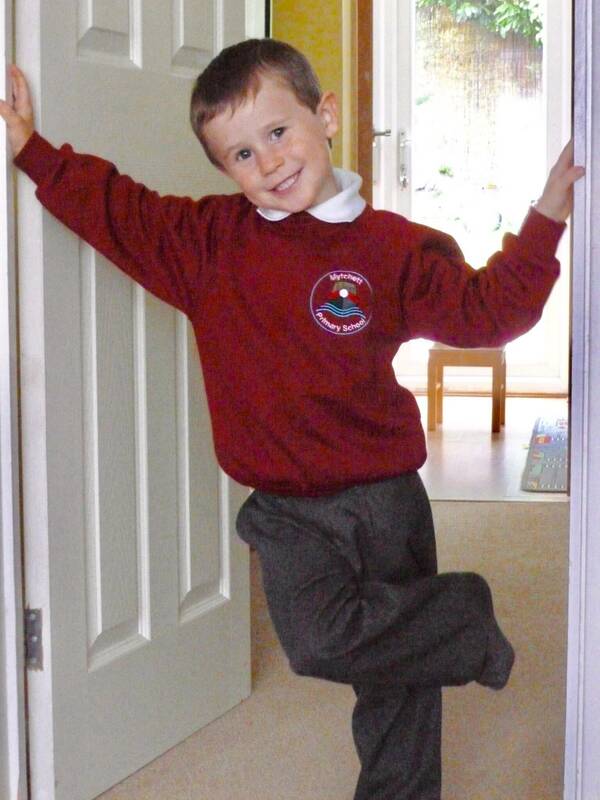 Today is my golden moment… his first day at secondary school and he made it all day. 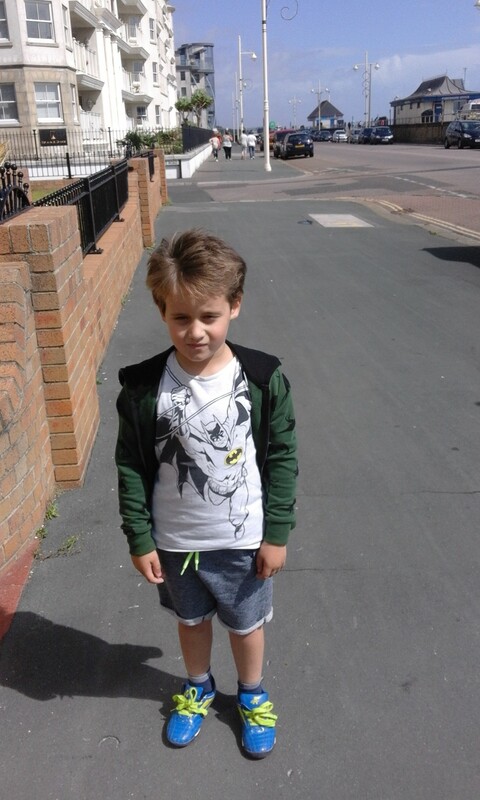 So proud of how he has taken everything in his stride, especially with having lost all if his hair. Super proud right now. I am unsure what sort of moments you are looking for but our golden moments seem to be where she managed to make everyone smile regardless of what she was going through. My daughter Esme was diagnosed with ALL in June 2016 and over Halloween last year she was admitted with unexplained fevers. She was initially so upset to be missing Halloween, especially as the weekend before she had missed her sister’s birthday party too. But she found a way to make it work. 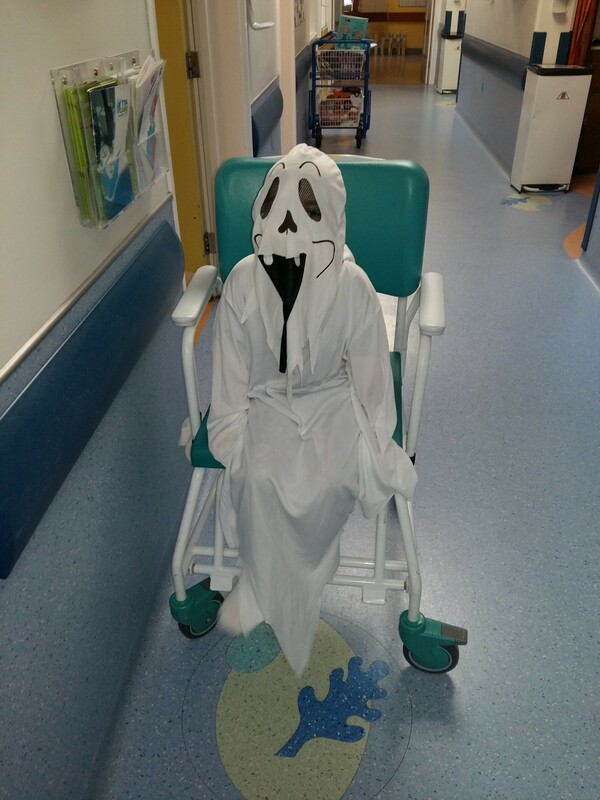 I remember how she dressed up in a full ghost costume and sat on a commode outside her room scaring all the doctors and nurses. She has always found a way to make others smile even though she has missed so many things. 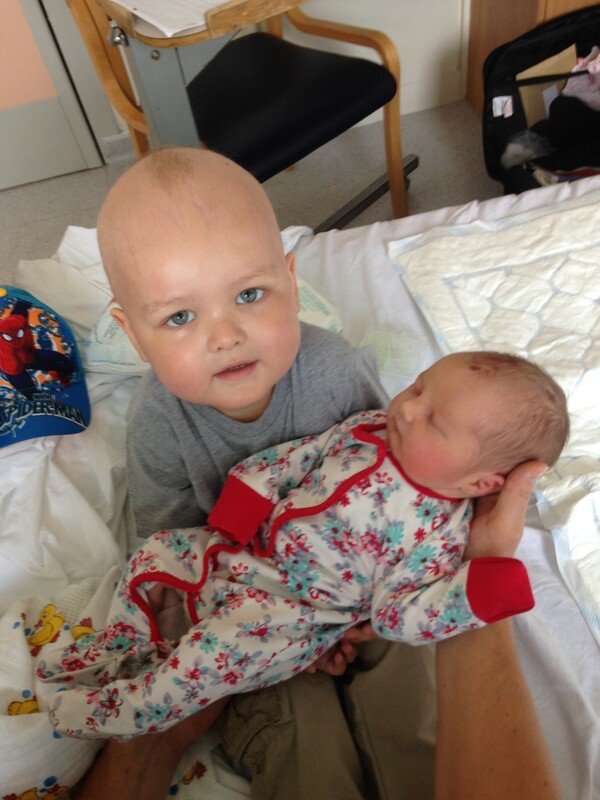 When our 3.5 years old son Jakub was in his second month of ALL treatment his little sister Anna was born. Jakub had suffered from legs pain due to chemotherapy and steroids. He stopped walking at one point. When his sister was just couple of hours old he came to visit her in the hospital and when he held her in his arms he told me that he needs to start practicing walking again because he is a big brother now and his duty is teach her everything. I am attaching a picture of their first meeting. Josh ringing the end of treatment bell after four months in hospital of grueling chemotherapy. 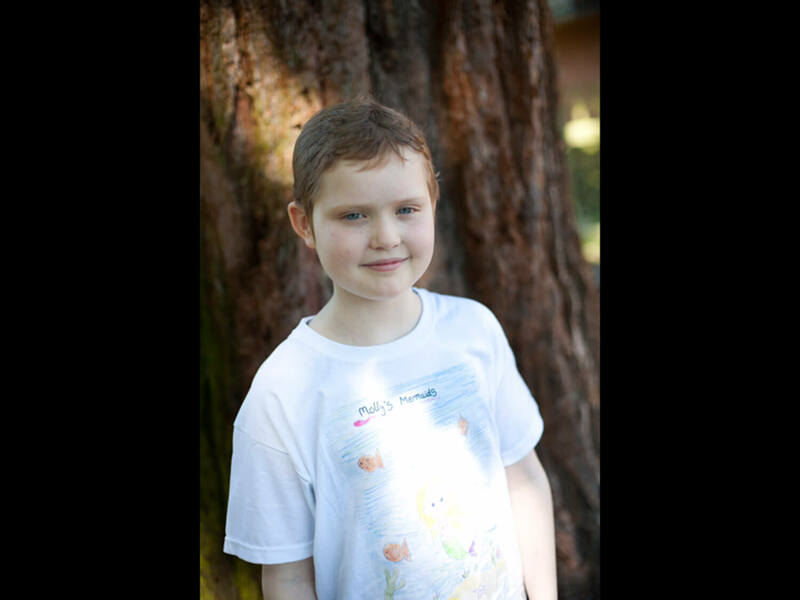 Josh was diagnosed with Burkitt Lymphoma. Our Golden Moment is when Josh managed to eat and drink something and take some steps. After seeing our little boy so poorly, words cannot describe how incredible it was to see Josh trying something to eat and put food to his mouth. It was a nibble of a chicken nugget and it was the most amazing overwhelming feeling ever. Everyone celebrated with us, including the nurses; it meant the world to them too. We helped him out of bed and although he was incredibly weak, he stood unaided and although very wobbly with our help, he took a couple of steps. There are no words to describe how amazing it felt. Imagine seeing your child walk for this first time but the feeling was so much more powerful. After so many dark days, this was such a wonderful golden moment in our journey. 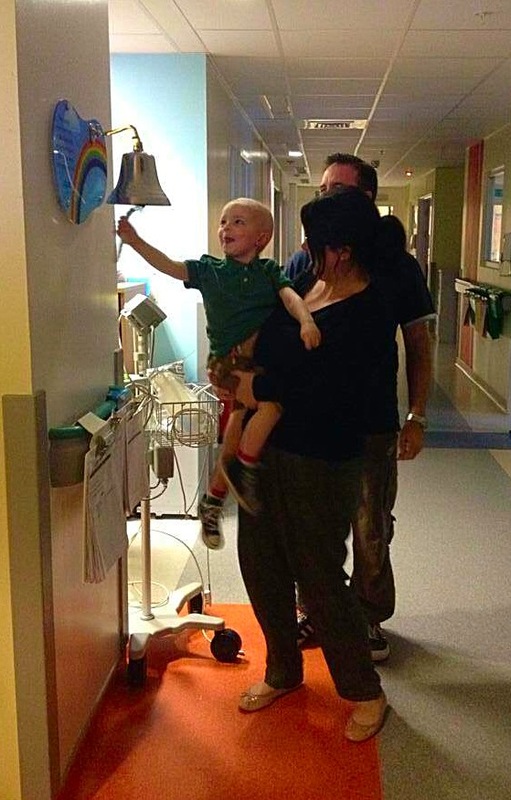 Another golden moment – Josh ringing the end of treatment bell after four months in hospital of gruelling chemotherapy. This special bell was placed on the ward during our time there and was introduced by another oncology family on the ward. The bell gave us so much hope, we longed for the day that Josh would get to ring it and we could start the next chapter of his life. We heard the bell rang several times when we were there and it was amazing to see all the families and doctors and nurses gathered round celebrating with that child and their family, it was very emotional and very special. It became something we focused on with the hope it gave us and we were able to show Josh and tell him he would be able to ring that bell too very soon. On July 18th we had that moment, everyone gathered round; we were able to thank everyone for everything they had done for us during Josh’s time on the ward. Josh rang that bell loud and proud, everyone cheered and celebrated. 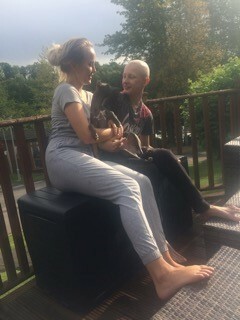 It was such a special moment and at that point we walked off the ward (our home for so long) and took our superhero home ready to start his new life. A very special golden moment. Our Golden Moment was ringing the end of treatment bell on the ward at the Queen’s Medical Centre in Nottingham. 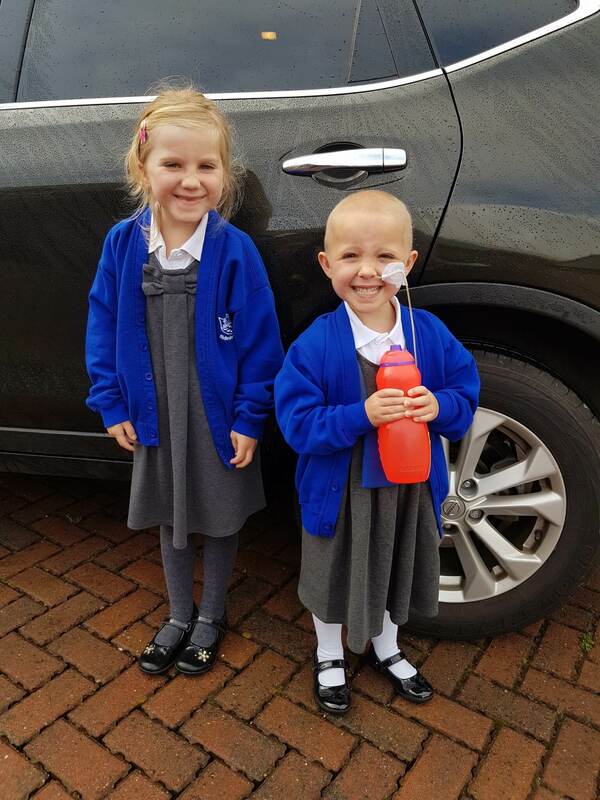 This was the day Alice who is 7 had her port removed after fighting cancer a second time – relapsed Wilms. 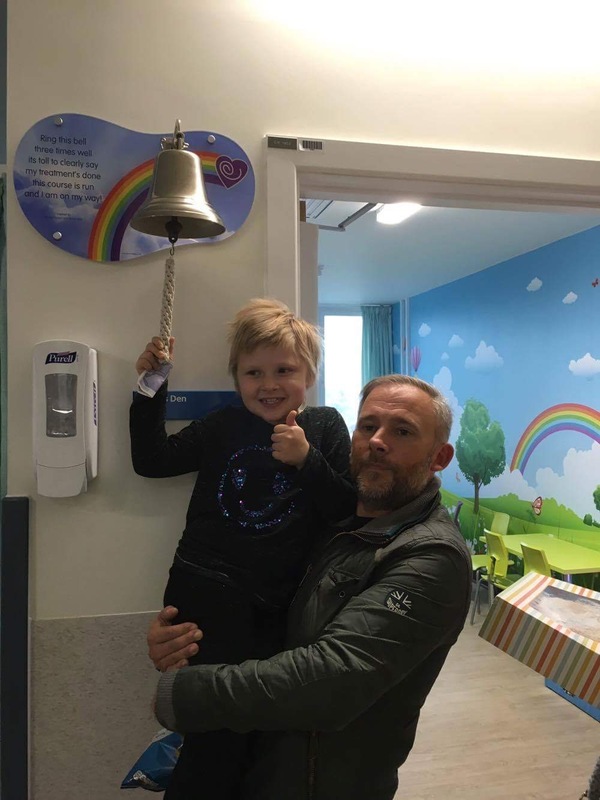 The bell wasn’t there when we finished treatment the first time so it was a really special moment to ring it loud and clear when we reached the end of a very difficult 3 year journey, surrounded by family, nurses and patients we had got to know. 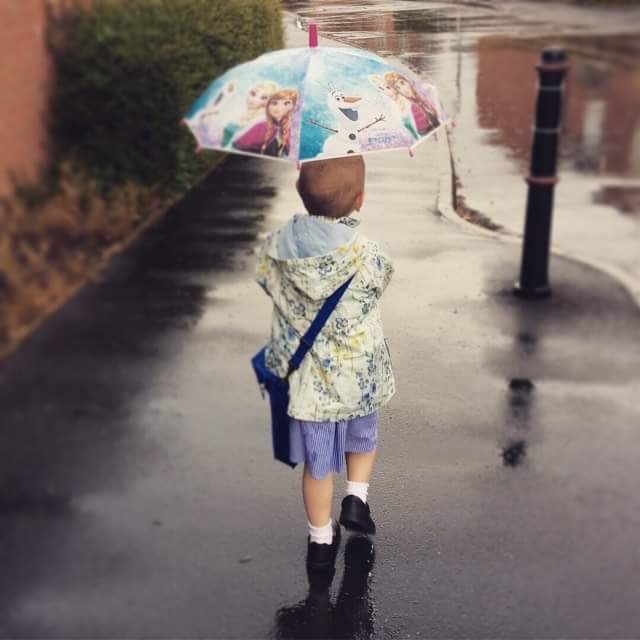 Alice is now over one year in remission and just started junior school. 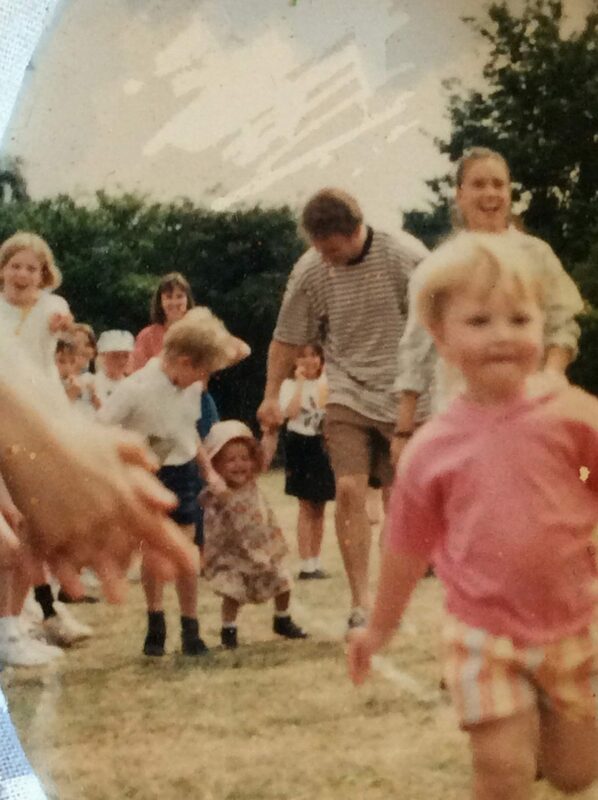 23 years ago I had childhood leukaemia. 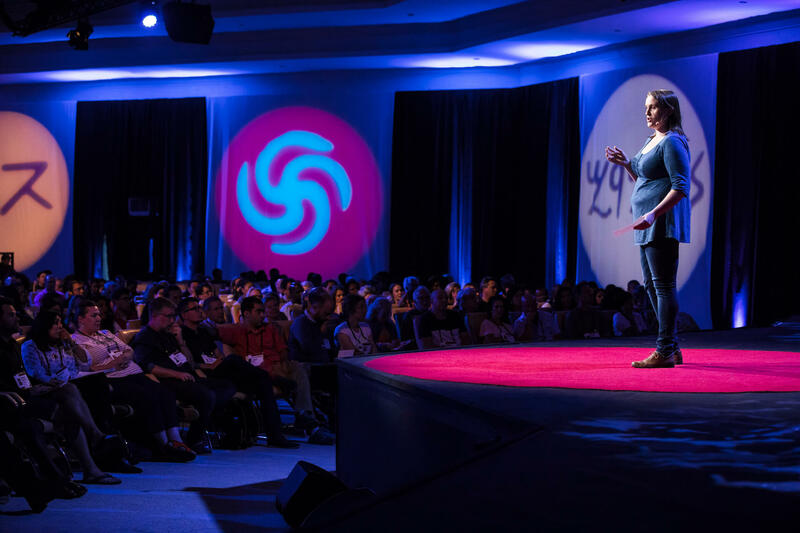 I grew up and became a research scientist and in August this year I took to the stage at the TED conference in Tanzania and gave a TED talk about my experiences as a cancer survivor and the importance of doing more research into treatment-related side effects. He smiled more than I have seen him smile in 9 months. Oliver’s golden moment was 3 weeks after his last chemo, 1 week before his hickman line came out, in a beautiful part of Devon on a lovely short holiday I took him on last week with his best friends – his big Sister Megan and his lovely adorable puppy Dobby who Oliver loves so much and who has helped a 14 year old boy cope with being diagnosed with Rhabdomyosarcoma, cope with major surgery and 9 months of chemotherapy and radio therapy. He smiled more than I have seen him smile in 9 months. 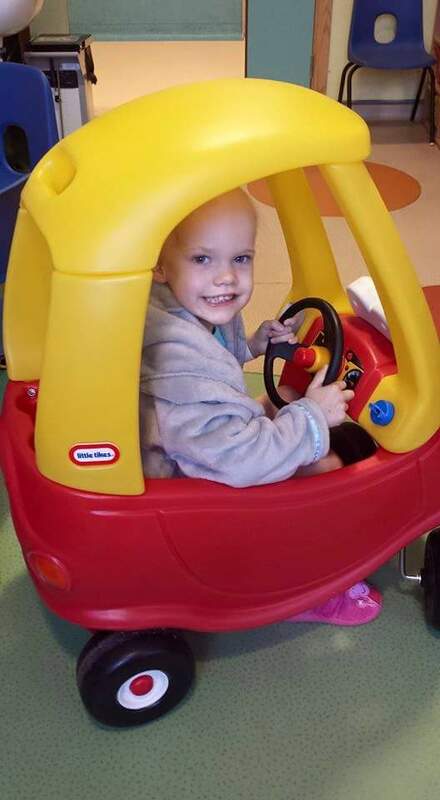 “My daughter Matilda was diagnosed with Acute Lymphoblastic Leukaemia in December 2016. My golden moment was Matilda’s first day of school. This golden moment was unlike so many of the more recent proud moments….it was NORMAL. For the first time in too long, I got to be proud of Matilda for a normal thing. Not proud because my four year old had taken her oral chemotherapy in tablet form rather than its usual liquid form……..not proud that she didn’t get anxious before having the big port needle jabbed into her chest to administer more chemotherapy………not proud because she willingly accepted the reason that she couldn’t go to yet another party or event, because the risk of infection was just too high, not proud because she’s finally pooped out a monster poo, over a baby bath, that has had her screaming in agony for days, another side effect of chemotherapy, not proud because my little girl didn’t completely freak out before being put to sleep yet again, for another all too regular lumbar puncture. 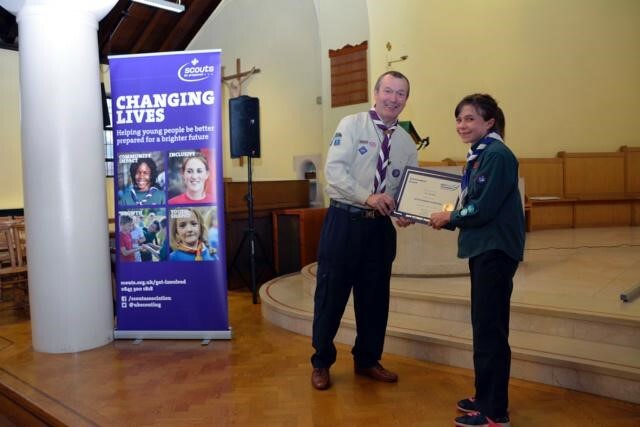 Here is Tara receiving a Jack Petchey award for her outstanding achievement to Scouts. 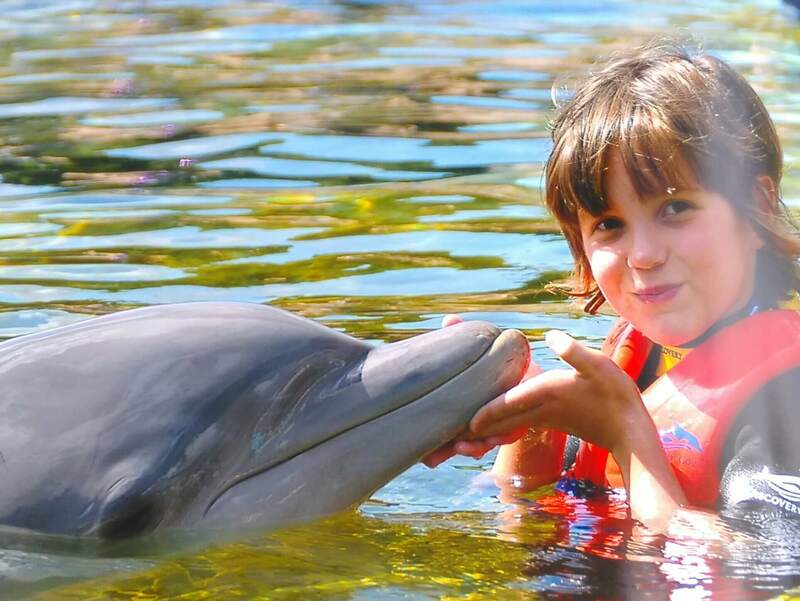 There have been so many Golden Moments since Tara finished her treatment just before she started primary school. 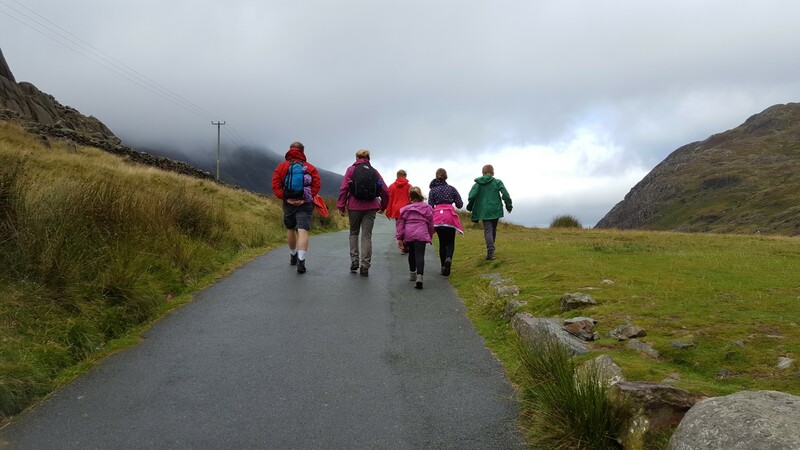 More recently a huge moment was her moving on to Secondary school and her active involvement in Scouts. Last Christmas she took part in a Panto and friends and family noticed how carefree and happy she looked dancing and singing on stage. It was definitely a golden moment. Here is Tara receiving a Jack Petchey award for her outstanding achievement to Scouts. This was in relation to her commitment to Panto last Christmas. This was presented by Steve, District Commissioner, Southgate Scouts. 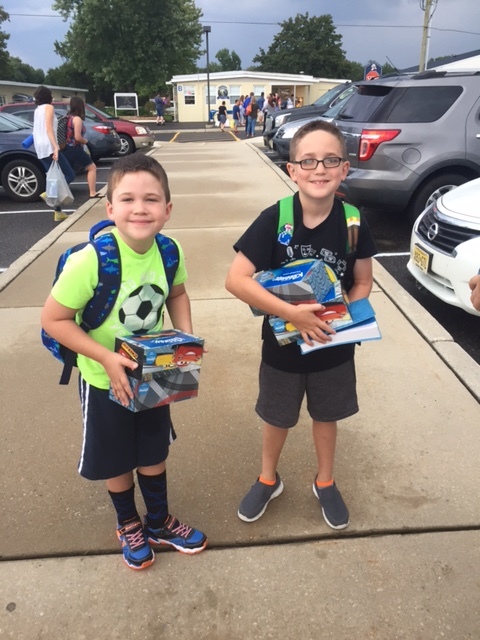 Excited to start back at school after 18 months of home tutoring. 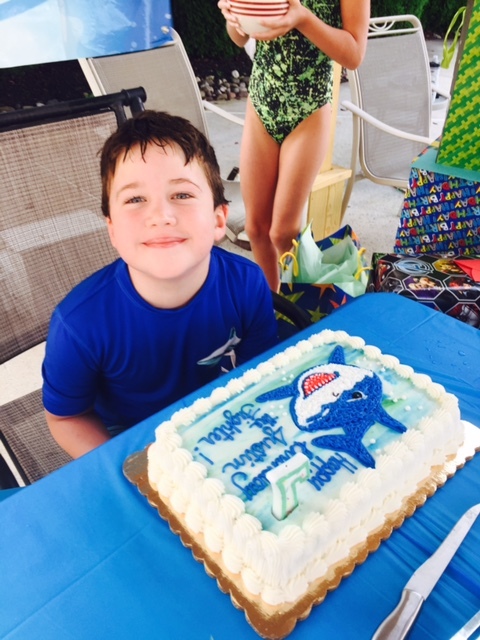 This summer, Justin enjoyed playing at the park, had a blast with friends and family at his “shark-themed” 7th birthday party and was excited to start back at school after 18 months of home tutoring. 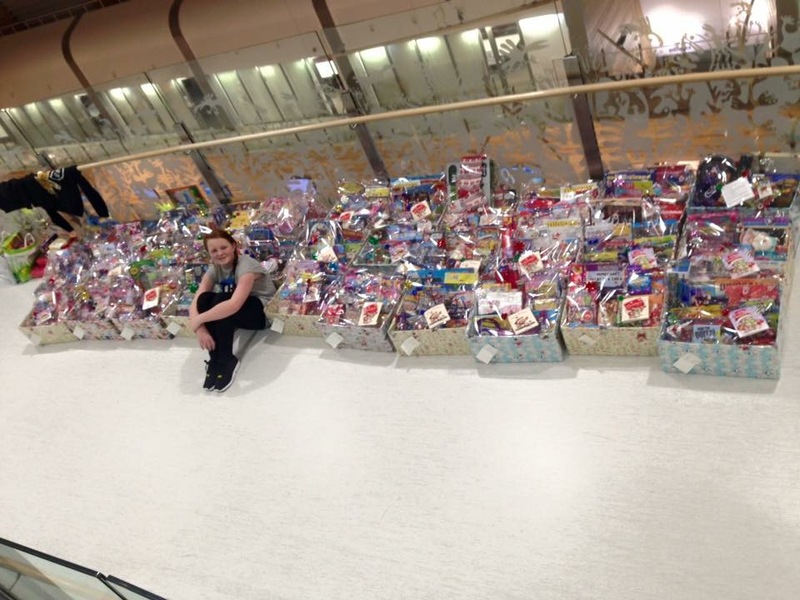 Our proudest and most golden moment was Christmas 2015; Emma decided to make one Christmas hamper filled with goodies for all the children to share. Our town came together and donated everything from sweets, toys, dvds etc and she was able to make 35 hampers, allowing one for every child. She decided to do it again for the 2016 Christmas, Emma personally handed them all out with a little card explaining about her journey and why she is giving back. And this year it snowballed and again she made 35 hampers. Ellie just got out of her seat and went over to join her class teacher at the front. 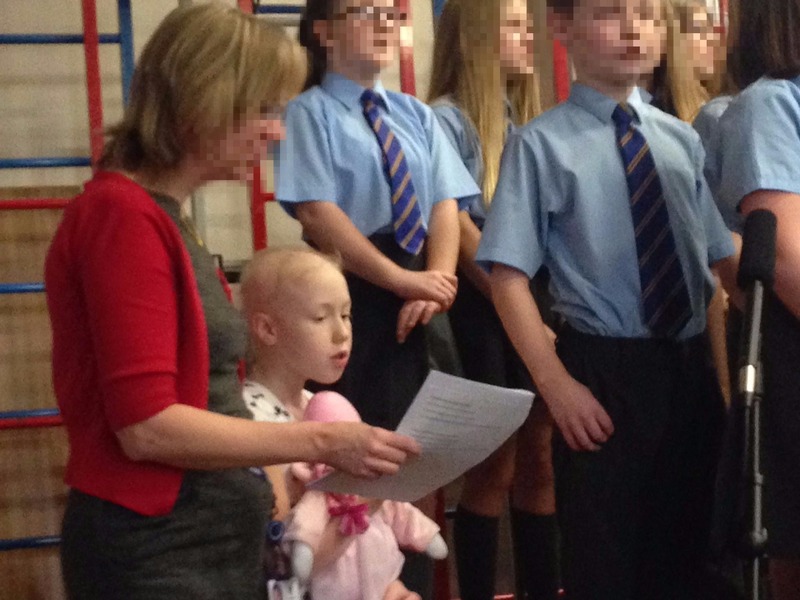 This was a really touching moment – Ellie and I went to the school concert which she would have been taking part in. She wanted to go and I asked the school if we could have seats reserved for us near the door in case she felt unwell and we had to duck out. But halfway through the concert, Ellie just got out of her seat and went over to join her class teacher at the front. The doll she is holding was made for her by the grandma of one of her class mates. 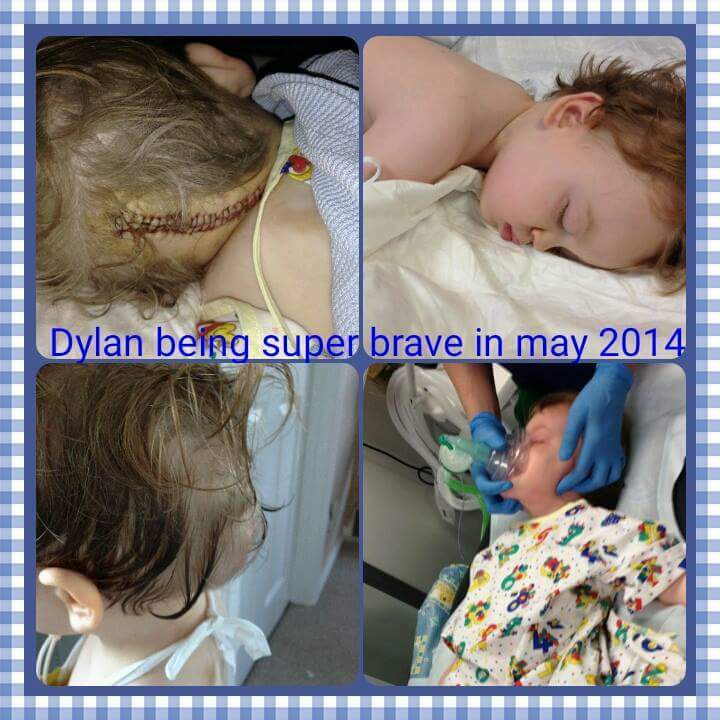 Dylan survived 9.5 hours of brain surgery and was awake and talking the same day. Golden Moment #1 :Dylan survived 9.5 hours of brain surgery and was awake and talking the same day. 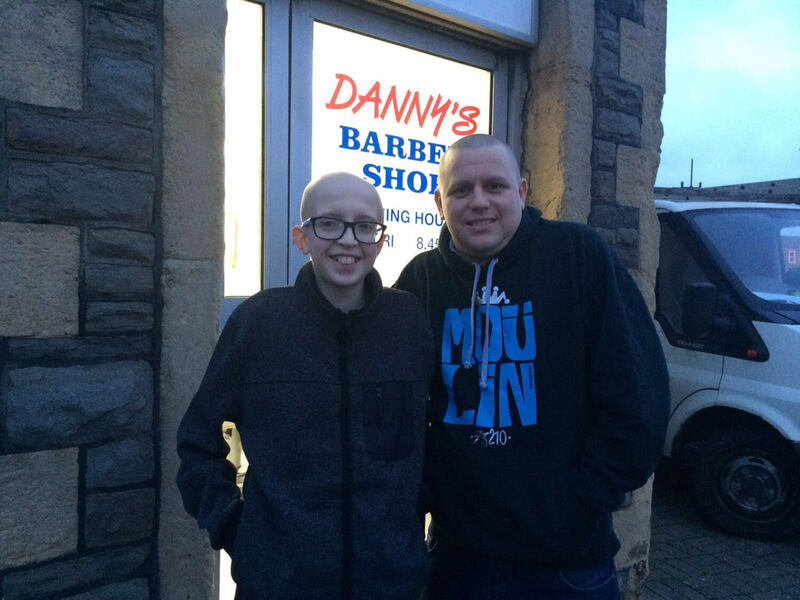 Golden Moment #2: Dylan survived 6 weeks of radiotherapy after his relapse. He started the course in a really bad way, he was barely able to walk and doctors warned he could die or become permanently paralysed. He skipped out of the hospital 6 weeks later. Golden Moment #3: Dylan finally had his hickman line out and once the site had recovered, we celebrated by taking him to an all expenses day trip to centre parcs in Woburn. Seeing Dylan playing in the water with his brothers was nothing short of magical! I think that our family’s really true golden moment is still to come. In October my brilliant amazing baby girl finally reaches her 5 year remission day. 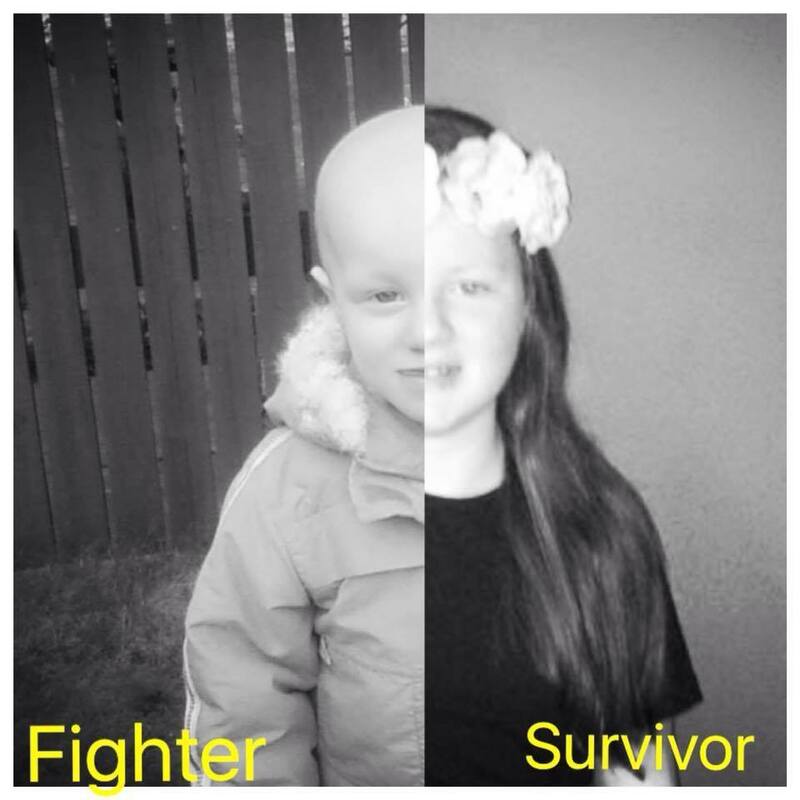 She was diagnosed with Hodgkin’s lymphoma stage 2 in 2012 when she was just 5 years old. Boy did she literally bounce through her treatment, and she has not sat down since. 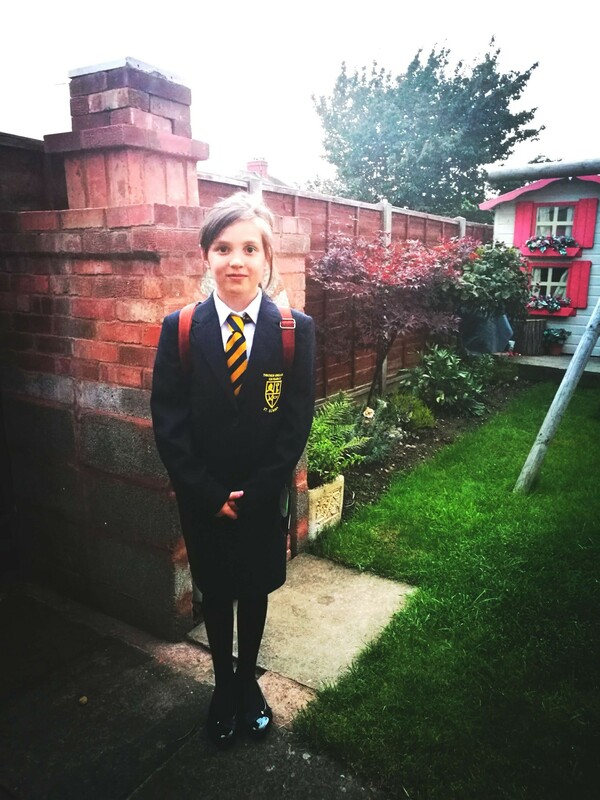 Now she is probably the healthiest child I know (maybe a bit of anxiety issues) but has not even needed a doctor since now she is in her last week year of primary school nearly ready for a whole new chapter of her life to start. Big school will start and my baby girl is gonna shine and bounce just like the Tigger we nicknamed her after. You go my beautiful Courtney Summer. Starting her life in primary school on her first day with her gorgeous sister. Thought I would send you one of our golden moments so far and there have been quite a few but this really is special, it’s hard as at times throughout this horrible process, you see your child all weak, being sick and telling you they want it to stop and to go away and then you see your child 8 months down the road with a huge grin on her face starting her life in primary school on her first day with her gorgeous sister!!! Daisy is such an inspiration and we love her strength and determination. A very new Golden Moment, one that’s taken 10 years to achieve! 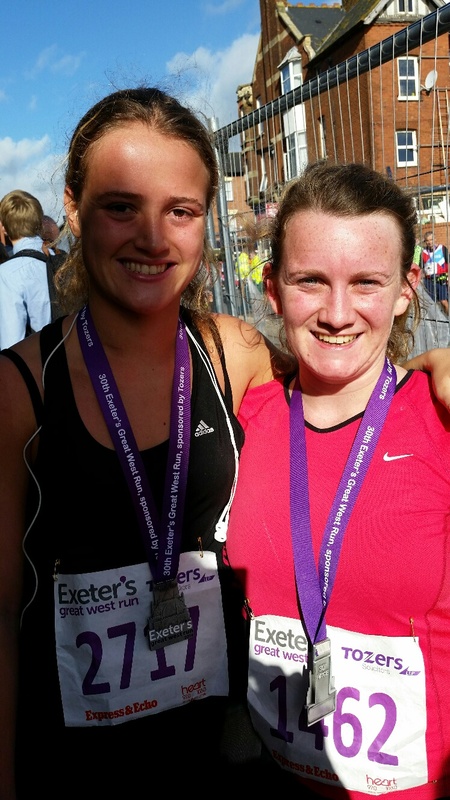 When Charlotte was first diagnosed with ALL in 2006, she set herself two major challenges; one was to run the London Marathon which she did with her sister Harriet in 2015 and the second was to cycle to Paris. 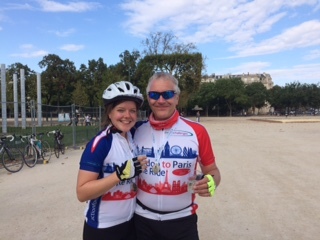 She completed the London to Paris cycle ride with her dad at the beginning of this month (September 2017). 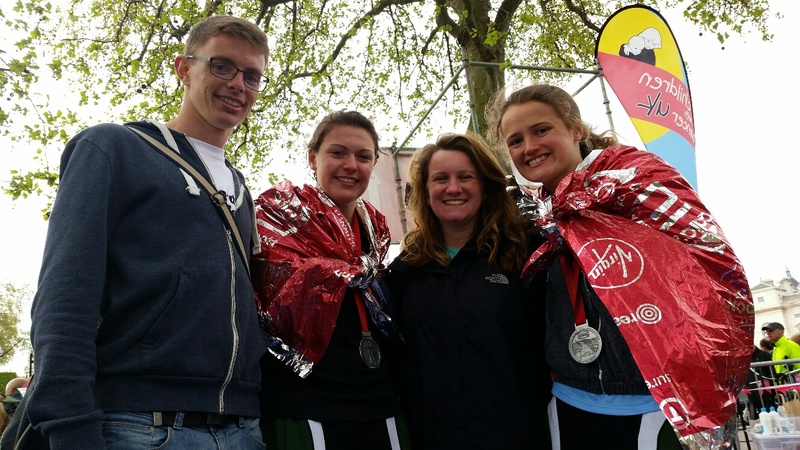 Through sponsorship for these events she has raised almost £6000 for Children with Cancer UK. 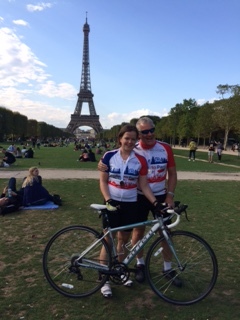 They both found it a hard and challenging experience, but were delighted to arrive at the Eiffel Tower after three long days in the saddle. • Hardly missing any school during treatment and even playing in school teams on the days she had lumber punctures. • Meeting the England Football team including David Beckham during her treatment. • The day Charlotte’s treatment finished on 11th November 2008. 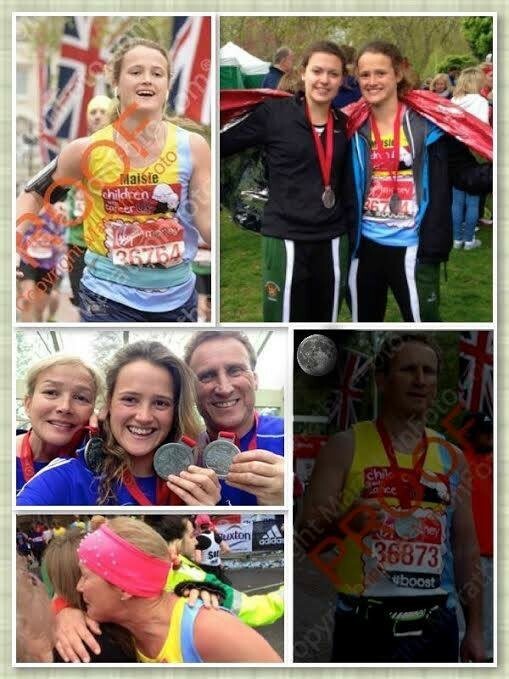 • Completing the London Marathon in April 2015. 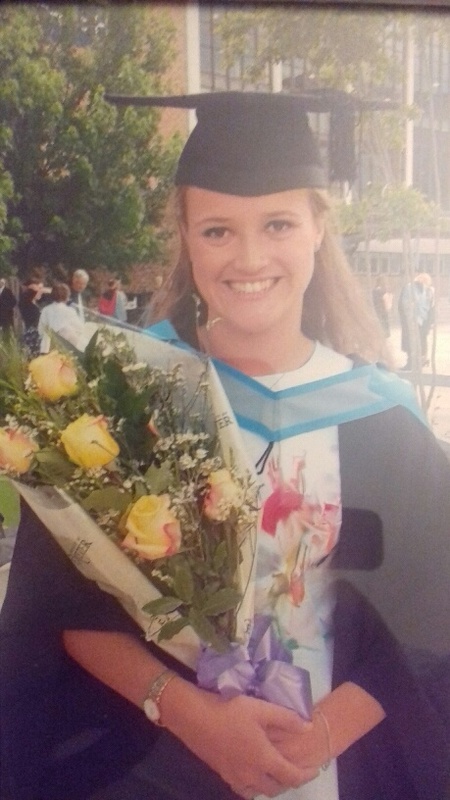 • Gaining a first-class degree in Computing in July 2015, after everything she had been through. 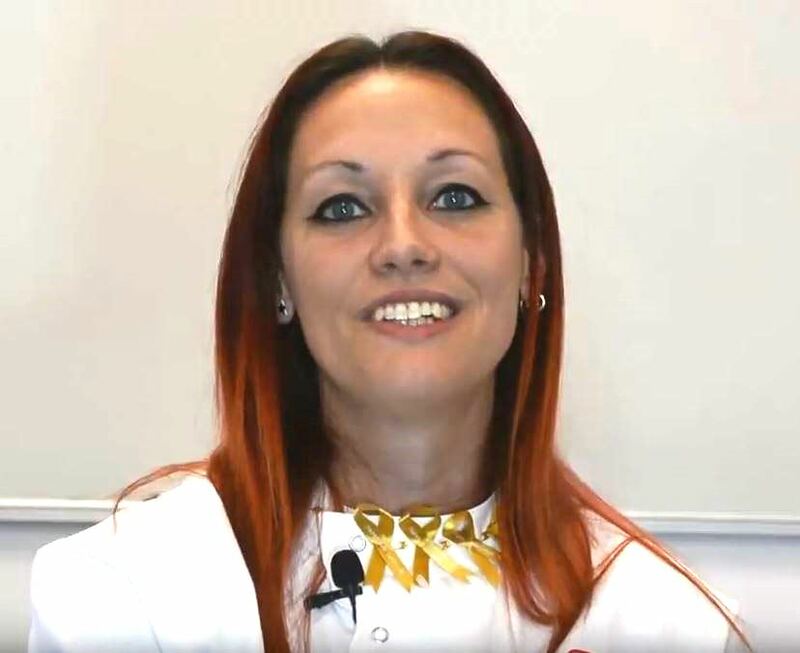 Zoe, a researcher from The Institute of Cancer Research, London, talks about her project that looks into Identifying new treatments for children with rhabdomyosarcoma, her funding from Children with Cancer UK, her golden moment in her research and a message to families and children undergoing childhood cancer treatment. It was good for the kids to be away together as a family and being away from hospitals and doctors. Our Golden Moment was probably when I took both children away for a short holiday to Great Yarmouth. 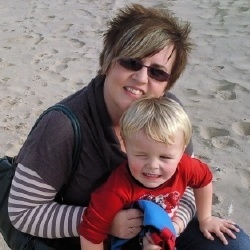 I remember so much had to be sorted to take Dominic away as he was on his second year of chemotherapy. 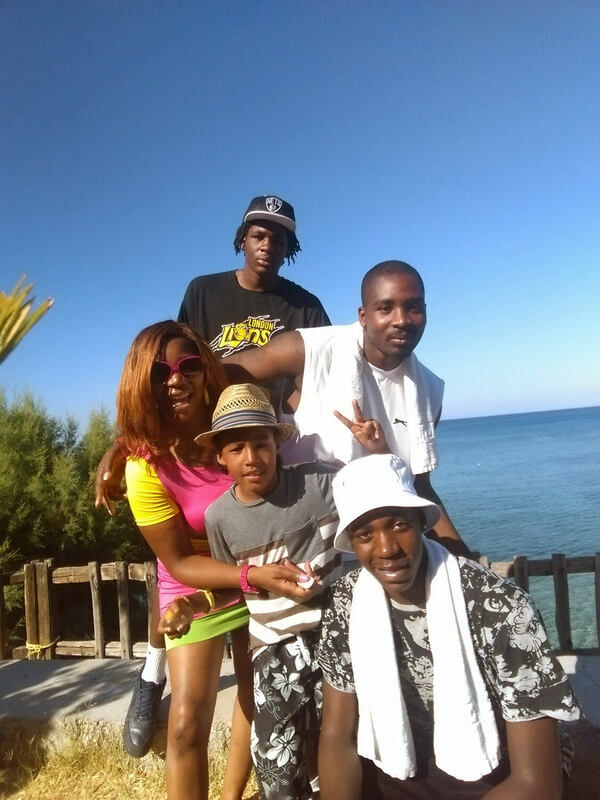 When we got away, Dominic stayed well and it was good for the kids to be away together as a family and being away from hospitals and doctors. Dominic and his sister really enjoyed it, just having time together to relax. 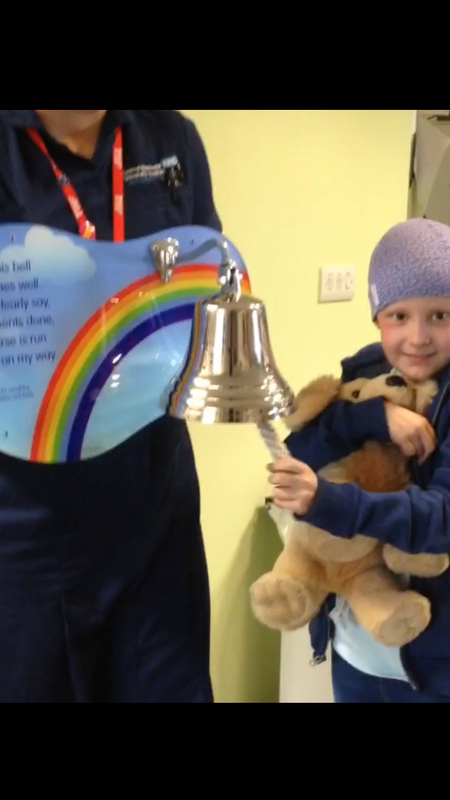 Emma’s golden moment – being the first to ring the end of treatment bell at Royal Manchester Children’s Hospital when she finished chemotherapy on April 9th 2014. 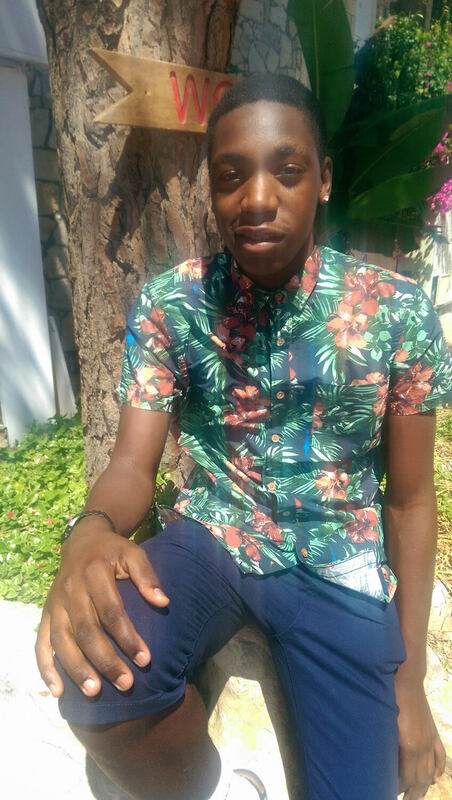 Ace was diagnosed with Acute lymphoblastic leukaemia. When he was just three years old, during his long stays in hospital Ace learned to play guitar and he got better and better as time went on. 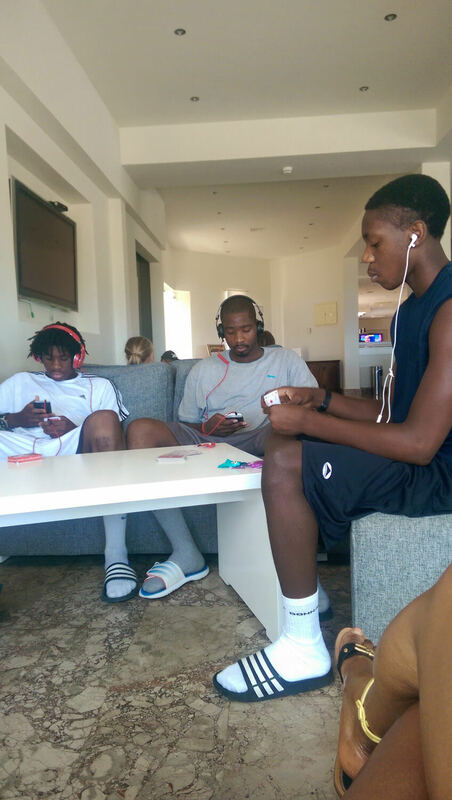 Ace found that playing music distracted him from all the hospital treatment and machines bleeping, it took him to a different place so he did not have to concentrate on what was going on. 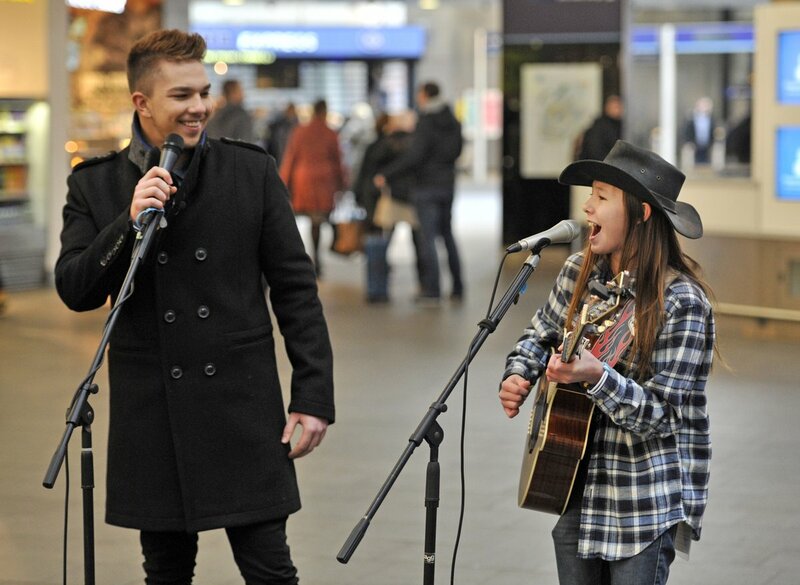 Ace regularly goes busking on the streets of Oxford and earlier this year he was asked to busk in Kings Cross Station in London, He was very surprised when Matt Terry the X-Factor winner joined him and started singing a few songs. It made Ace feel like all his hard work in learning guitar had paid off. The day in January 1970 we went to visit Ian, only to find his bed empty and fearing the worst. A voice called from the corridor and Ian came running to meet us. After a month of intensive treatment he then went 8 months without any treatment at all. Unfortunately, as you know, the drugs ceased working and he was back to the beginning. Ian led a virtually normal life for 3 years with his siblings but in those days things were different. 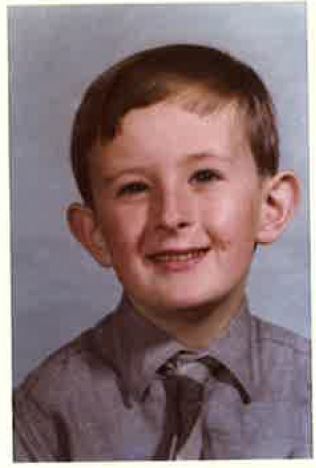 He even passed the 11+ and was due to go to the grammar school in September 1972. 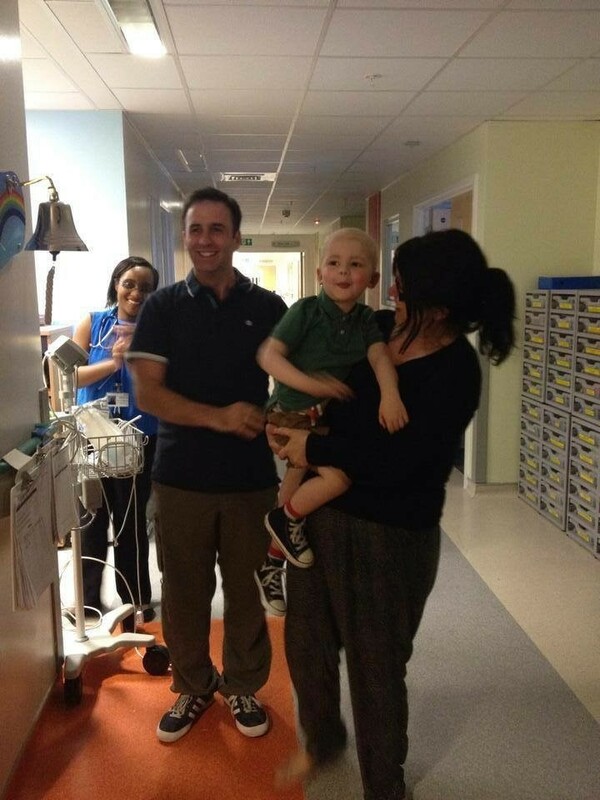 He was treated in Great Ormond Street Hospital.